SLAAA - Sp. 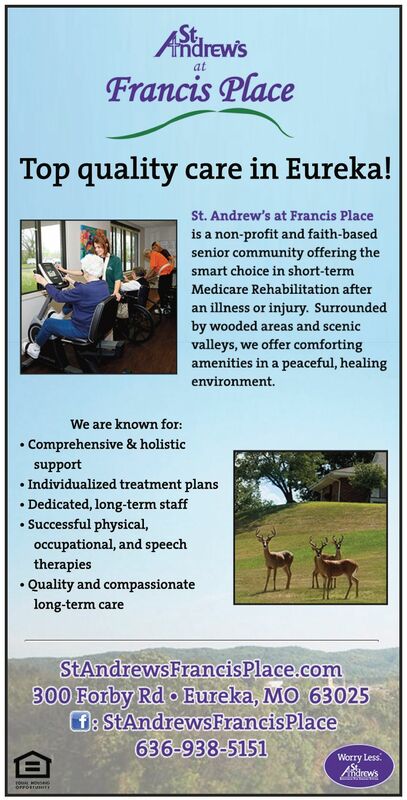 Needs S. County Senior Law Southern Bus & Mobility Spectrum Retirement SSM Health at Home St. Andrew's Francis Pl. Cardinal Ritter Senior Services is seeking to hire a full-time Development Director that will assist us working towards our mission. 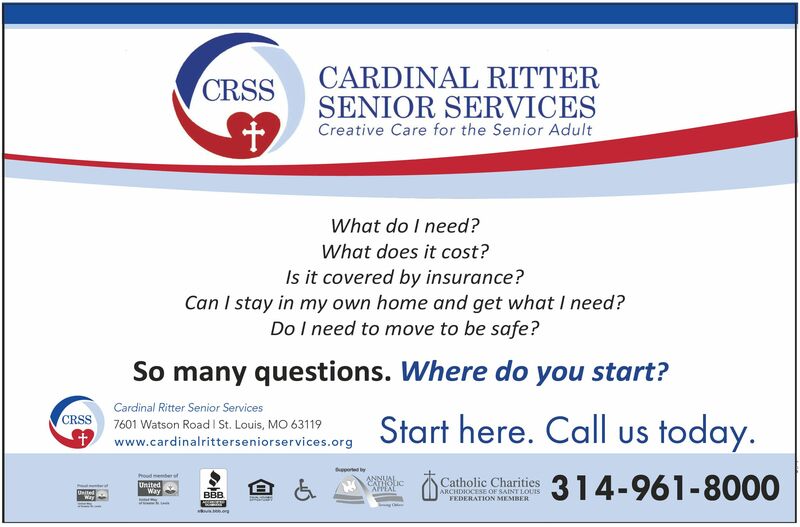 Cardinal Ritter Senior Services, the first choice for Love, hope, compassion, and integrity, Positive/professional work environment, Excellent quality of care, we work towards our mission daily, and Teamwork. We offer a comprehensive benefit package including Medical/Dental coverage, Life Insurance, Vacation, Sick, Holidays, Retirement Plan, Tuition Reimbursement and more. Cardinal Ritter is an Equal Opportunity Employer. St. Elizabeth’s Hospital initiates eight-week paid training for Patient Care Techs. According to the U.S. Bureau of Labor Statistics, employment of health care occupations is projected to grow eighteen percent from 2016 to 2026, much faster than the average for all occupations. Health care occupations are projected to add more jobs than any of the other occupational groups but the costs of getting trained for clinical care positions may be higher than some can afford. To help solve this issue, St. Elizabeth’s Hospital developed a new program to create a bridge into the industry. The Patient Care Tech (PCT) program is an eight-week paid training program that combines classroom education with hands-on clinical experience. The program consists of two classroom days every week for four weeks. Time is also spent working on a hospital unit for the first four weeks, followed by a four-week internship supported by preceptors. Upon successful completion of the program objectives, participants will have a position at the hospital. The second cohort will start in April 2019. Applications are currently being accepted and are available online at www.hshscareers.jobs. To learn more about the program email Gorka at Lleyna.Gorka@hshs.org or call 618-234-2120, ext. 12548. 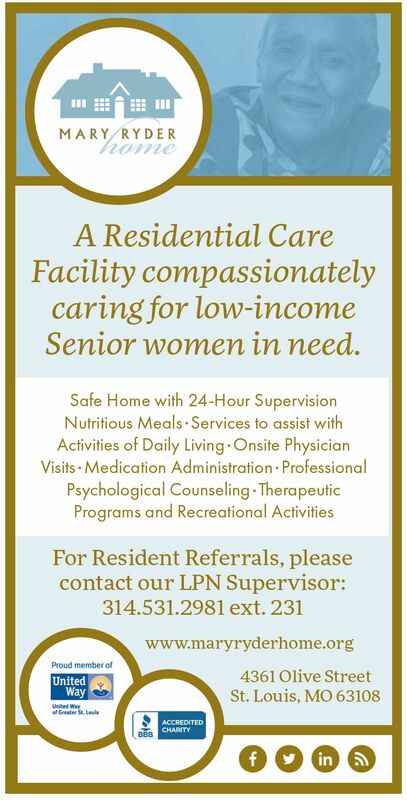 Seeking to hire full-time, part-time and prn nurses for all shifts that will assist us working towards our mission. 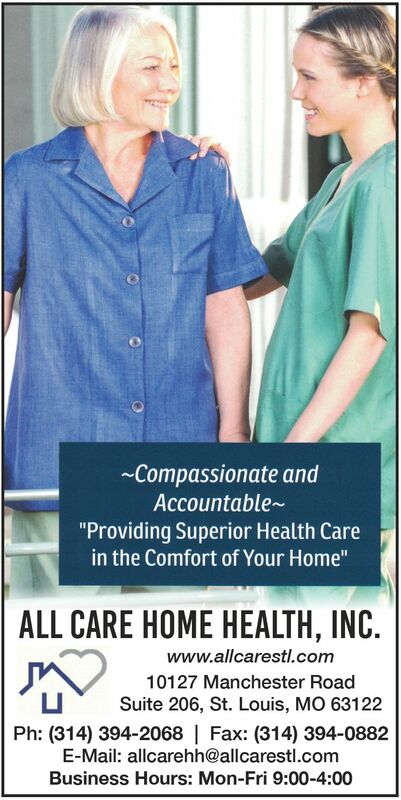 Mary Queen & Mother is the first choice for Love, hope, compassion, and integrity, Positive/professional work environment, Excellent quality of care, we work towards our mission daily, and Teamwork. We offer a comprehensive benefit package including Medical/Dental coverage, Life Insurance, Vacation, Sick, Holidays, Retirement Plan, Tuition Reimbursement and more. Mary Queen & Mother Center is an Equal Opportunity Employer. 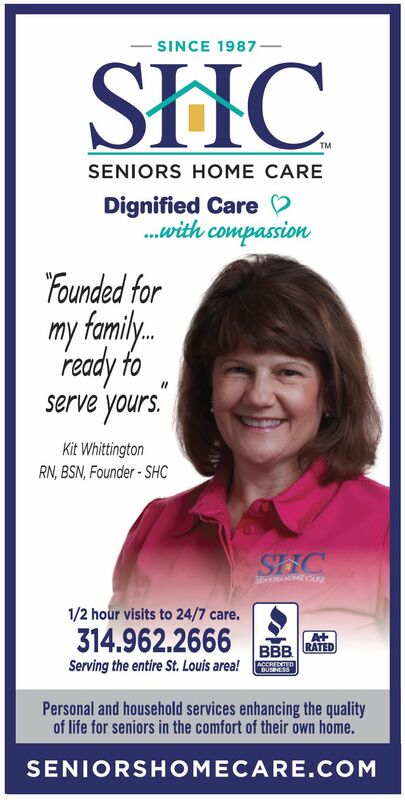 All Family Care is looking for an RN to join our "family" as Medicaid Director. The position is PT (20-24 Hours/Week). 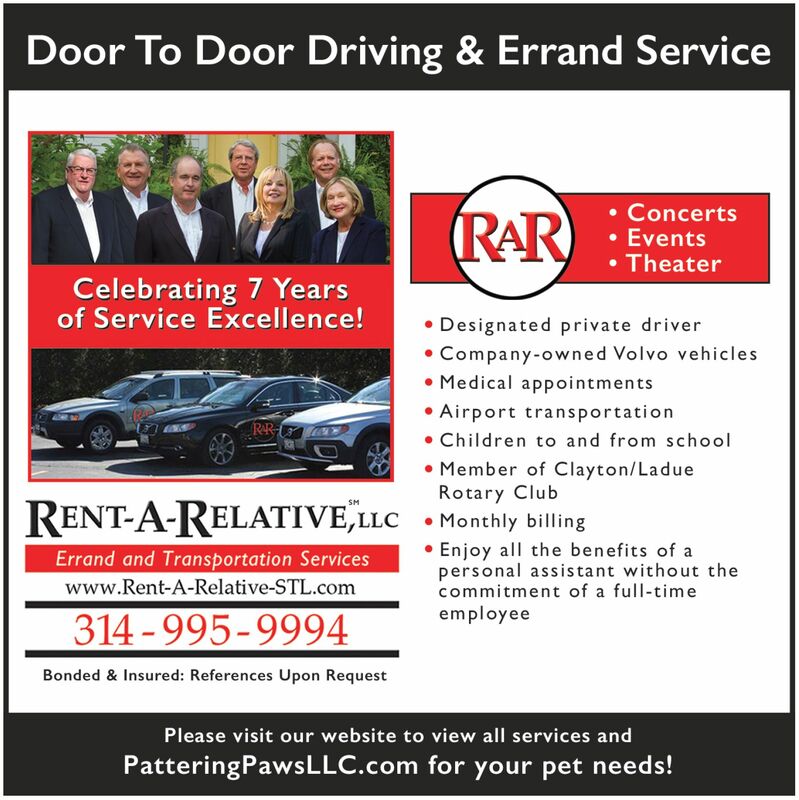 We are a small family owned business in our 14th year located in Affton, MO. This position is ideal for someone looking for additional hours and experience, or for someone who wants to slow down but not hang it up. The job requires interaction with the State of Missouri, clients, and co-workers. It is roughly 80% office, 20% field. Ideal candidate will have a sense of humor, attention to detail, and get along with others. 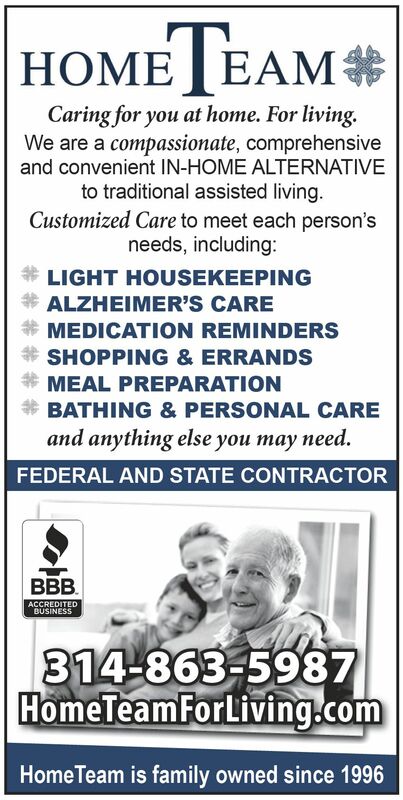 Please e-mail your resume to Gary Chippendale at gary@allfamilyhomecare.com. 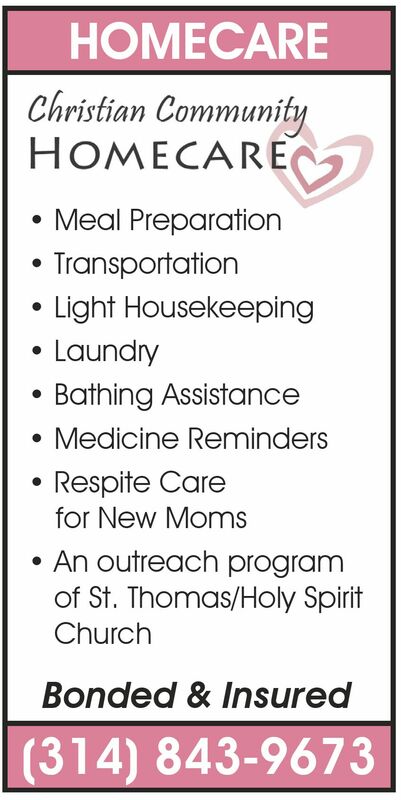 Christian Community Homecare, a non-profit outreach program of St. Thomas/Holy Spirit Lutheran Church, is hiring caregivers. Must have own vehicle. Call for additional information. We are growing again. 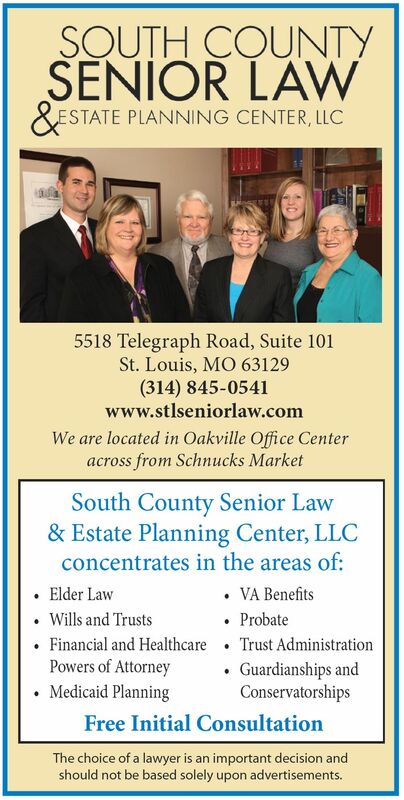 Beck Estate Planning and Elder Law in St. Charles is seeking an experienced estate planning paralegal to join our team. Requirements include drafting of estate planning documents, including trusts, wills, powers of attorney and deeds. Position includes maintaining file organization, scanning, faxing and filing, as well as interaction with clients. Applicant should be proficient using Word, Excel and Outlook. This is a salaried position with paid vacation, paid holidays, health insurance benefits, 401(k) plan and lots of extra perks not offered at most companies. Serious candidates are invited to email your resume today to info@beckelderlaw.com. For more information about our company, please check us out at https://www.beckelderlaw.com. Kristen Edens, LLC is a writer and content specialist with expertise in the health, medical, and aging industries. She offers writing services for online and print communications, including website, newsletters, email marketing, brochures, flyers, and other content needs. 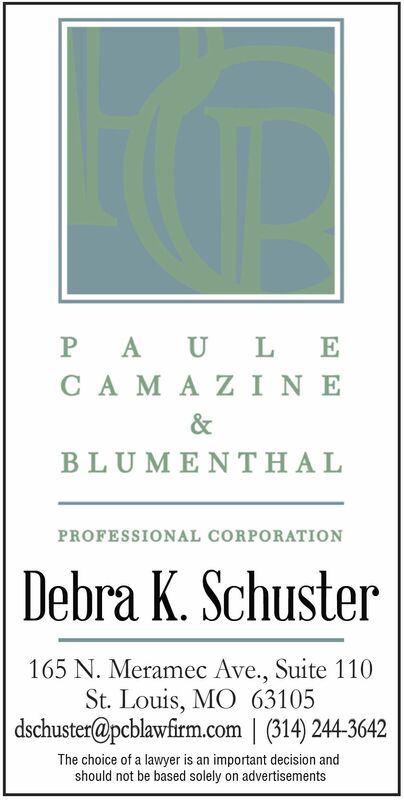 She is available to discuss your business communication and brand development. 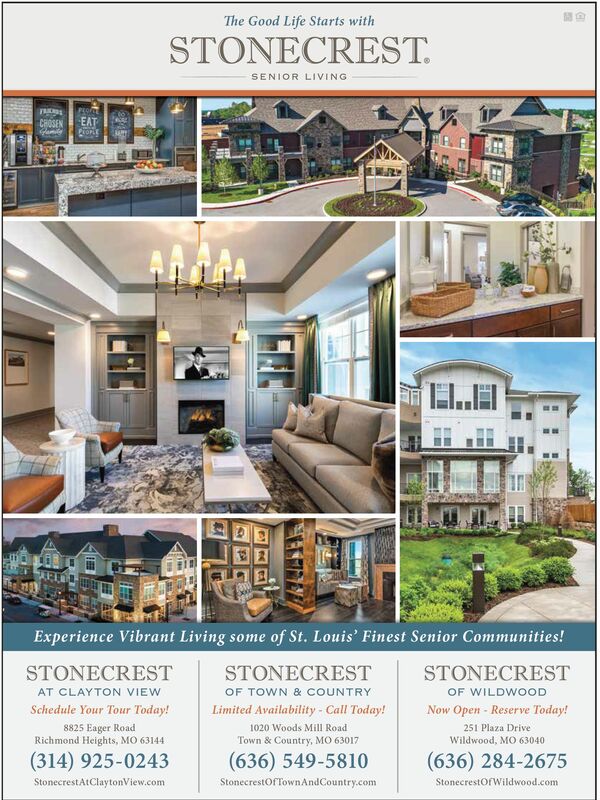 For more information, contact Kristen Edens at kristen@kristenedens.com, 314-856-5747, or https://kristenedens.com/. Mondays - 10:30 a.m. to 11:30 a.m.
Wednesdays – 1:30 p.m. to 2:30 p.m. 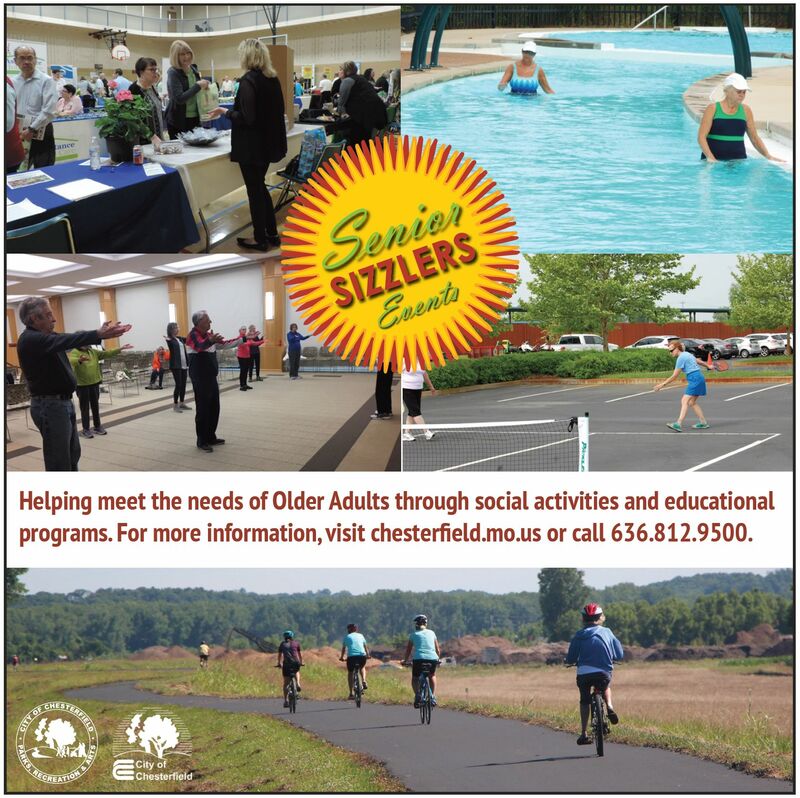 Please join to exercise at Chesterfield City Hall on April 17 thru 29 or June 3 thru 26. This program incorporates a series of gentle, pain free movements and is evidence based as one of the most effective exercises to prevent falls, improve health and the quality of life. Bike Rides first and third Mondays at 9:30 a.m. start time, April 15 at Chesterfield Valley Athletic Complex, April 15 at Forest Park, May 6 at Grant's Trail, June 3 at Meramec Greenway Trail, June 17 at Creve Coeur Park, July 1 at Chesterfield Valley Athletic Complex, July 15 at Forest Park, August 5 at Grant's Trail, August 19 at Al Foster Trail. 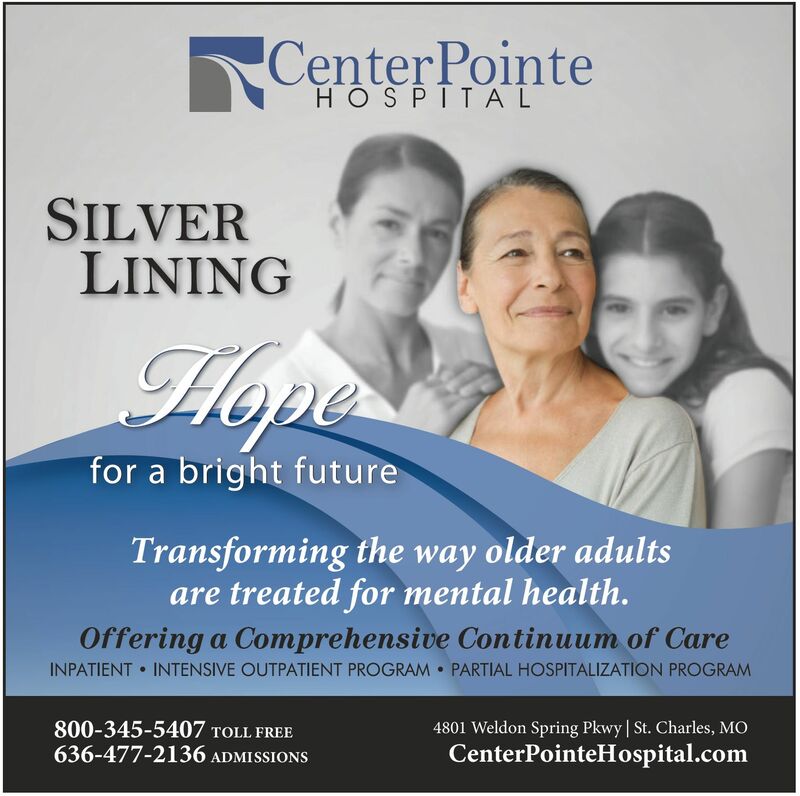 April 16 – 1:00 p.m. to 3:00 p.m. Learn more about Dr. Hassenstab’s smartphone-based, cognitive assessments for use by older adults in global Alzheimer’s disease observational studies and trials. Instead of focusing on a single assessment that can produce unreliable data, he is repeatedly sampling cognition in participants’ natural environments ‒ the very places in which they rely on complex cognitive operations in daily life. Date: April 16, 2019, 1:00 p.m to 3:00 p.m. Event Location: St. Louis Oasis in the Center of Clayton 50 Gay Avenue St. Louis, MO 63105. This event is free. To register, call 314-862-4859, ext. 24. May 8 – 10:00 a.m. to 11:00 a.m. Title: Is it the "A" Word? 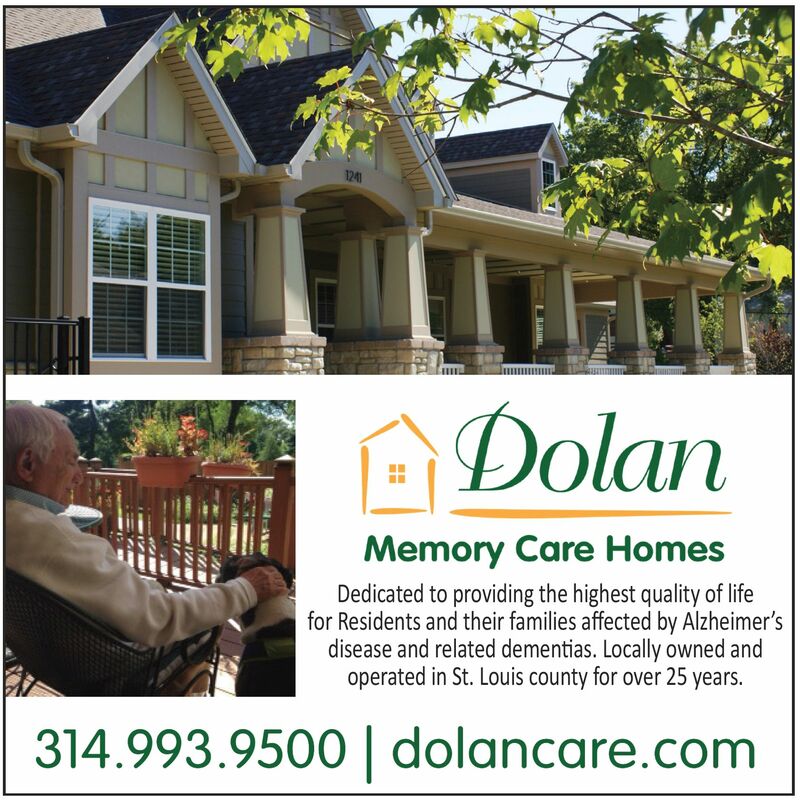 Myths and Facts Surrounding Memory Loss Description: Description: Join St. Louis Oasis and learn about the signs, myths, and facts surrounding memory loss. This class will discuss normal brain aging, the common signs of memory loss, and steps to take if you suspect it. Date: May 8, 2019, 10:00 a.m. to 11:00 a.m. at Christ Our Redeemer, 13820 Old Jamestown Road, Florissant, MO 63033 This event is free to attend, please register: 314-862-4859 ext. 24. Calling all Athletes (and volunteers). Senior Olympics signing up sportsmen and women, 50 or better. 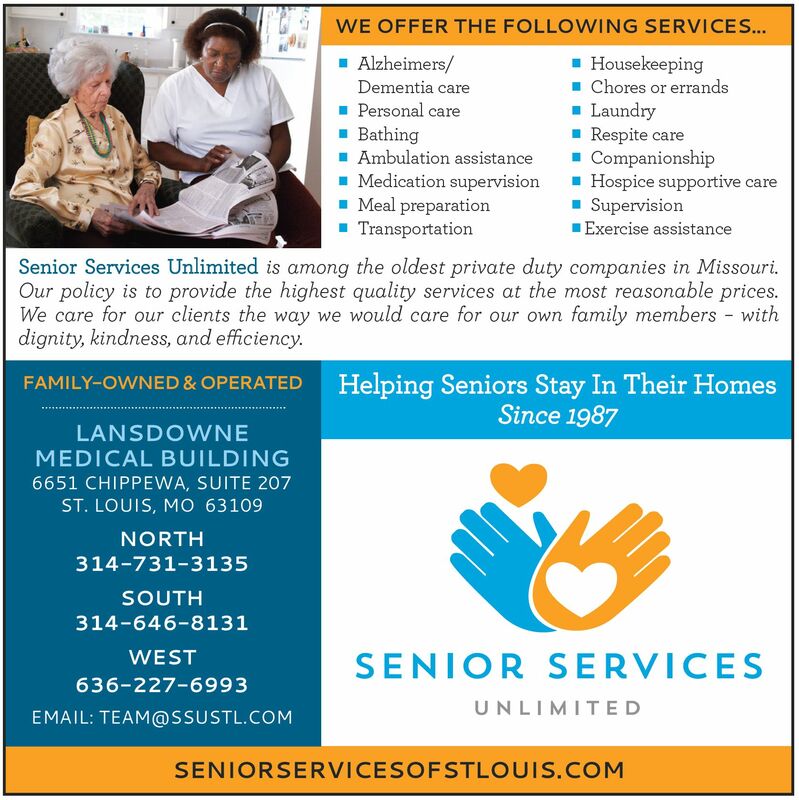 The St. Louis Senior Olympics, an Olympic-style sporting event for men and women age 50 and older, will soon embark on the 40th year. The Games will be held over Memorial Day Weekend 2019. This is a highly visible and organized event with more than 1,200 participants and 300 volunteers. 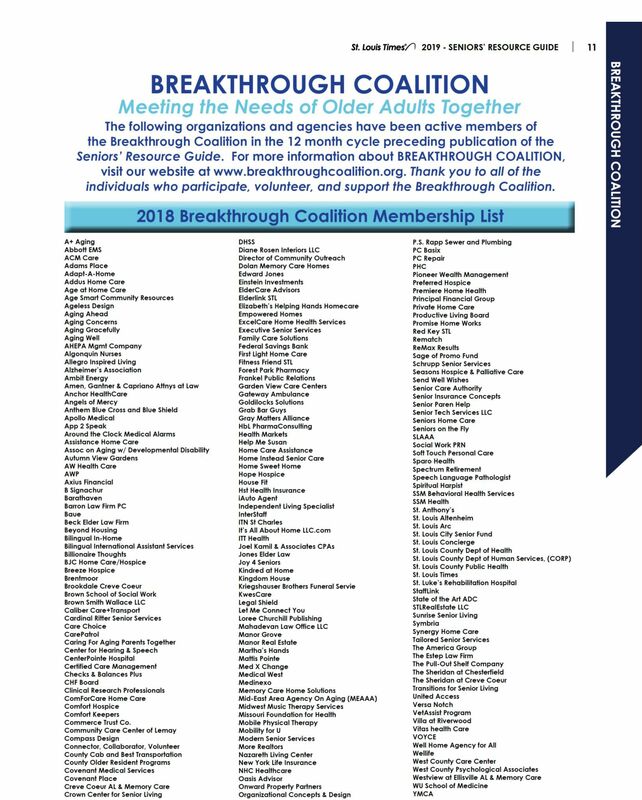 These amazing people are “newbies” and veterans, competitive and fun-seekers, and they join us from nearly 150 neighborhoods across 12 states. 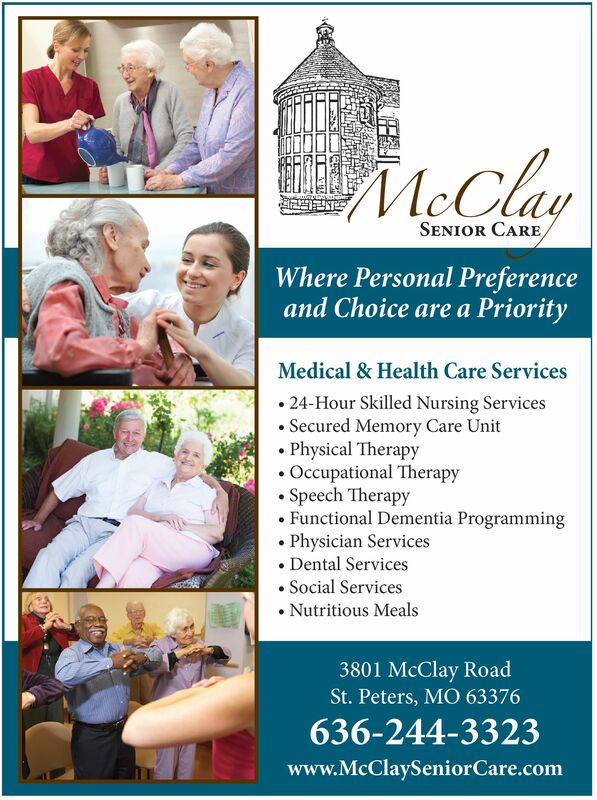 We are known as one of the premier Senior Olympics events in the nation. Our long-time success is due to the incredible support we receive from corporate sponsors, community partners, long time participants and dedicated volunteers who share in the excitement and camaraderie that is felt during those days of competition. “We have serious competition, friendly games, and performances. We have volunteer opportunities for all ages. The Games are a chance for the entire community to come together to celebrate the accomplishments of our seniors”, said Phil Ruben, Director of the event. 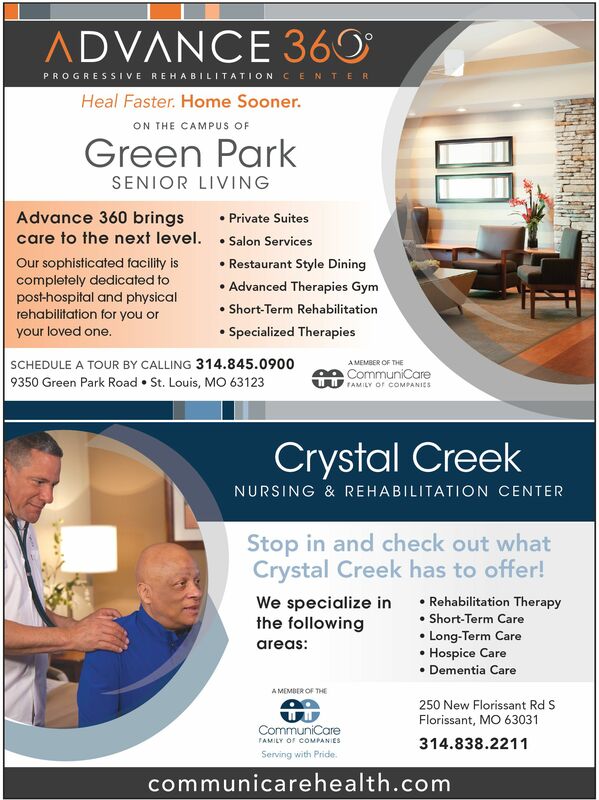 Visit stlouisseniorolympics.org for more information or call 314-442-3279. June 22 – 8:30 a.m. to 2:30 p.m.
2019 Gateway Dragon Boat Festival on Saturday, June 22, 2019 at Creve Coeur Lake - Sailboat Cove area from 8:30 a.m. to 2:30 p.m. The cost is free to participate in family festival activities and to watch dragon boat races. Team and sponsorships are available with information found on the website. Activities include live entertainment, kids’ zone, food vendors and race watching. Proceeds from teams and sponsorships go to Signature Foundation's Operation Family Help initiative which provides financial assistance for healthcare needs. The Pickleball courts are open every day from dawn to dusk at the Chesterfield Valley Athletic Complex. Paddles and balls are available in the Park’s Office during regular hours of operation. All that is needed to use the equipment is a valid driver’s license. 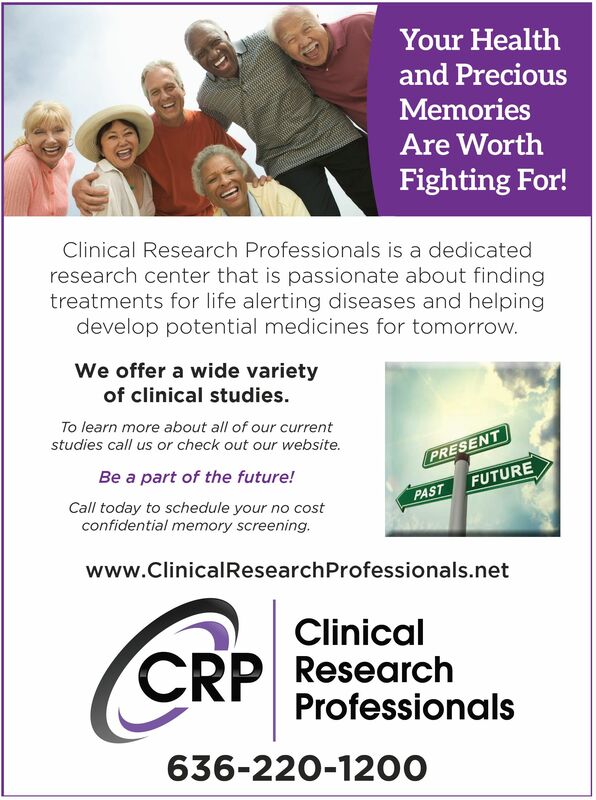 Brain Health Research Study seeks older adults, ages 60-85, do you have high blood pressure and memory concerns? Washington University’s Division of Geriatrics is seeking research participants for a dementia prevention study aimed at people with high blood pressure. 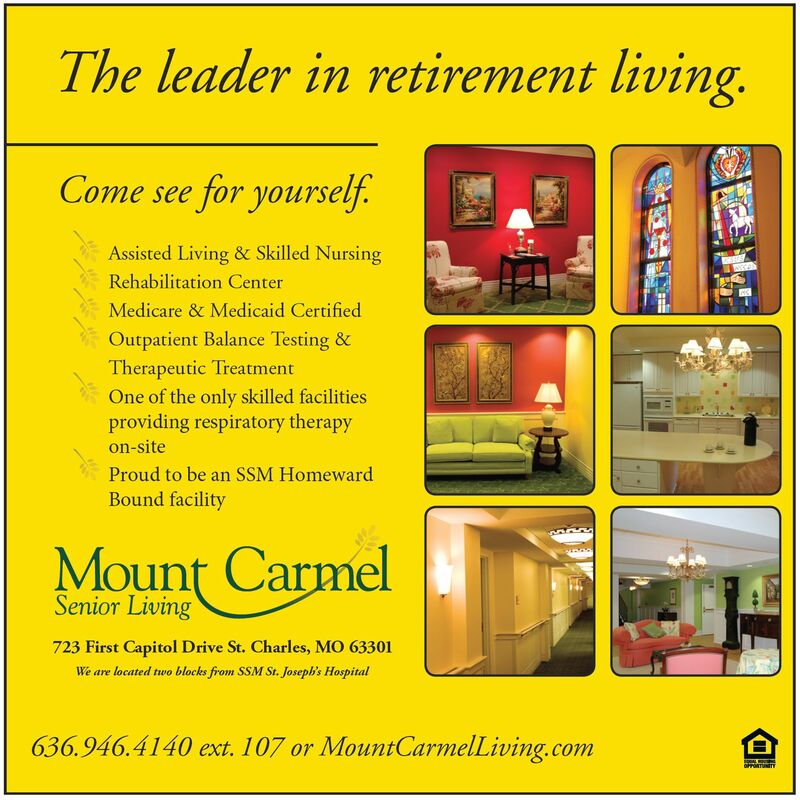 You may qualify if you are 60 to 85 years old, have high blood pressure, and do not exercise vigorously. This 2-year study includes strategies such as aerobic exercise, medication management of blood pressure, or a combination. 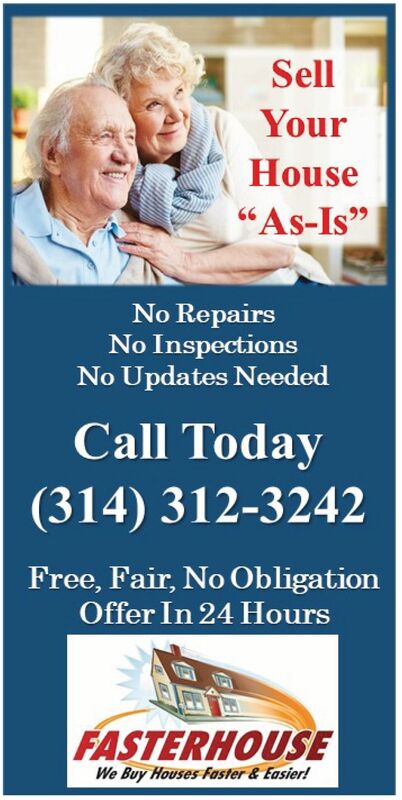 Call Adriana 314-273-1355. Insurance information is not needed. Measure your blood pressure, weight, blood sugar levels, and pulse. 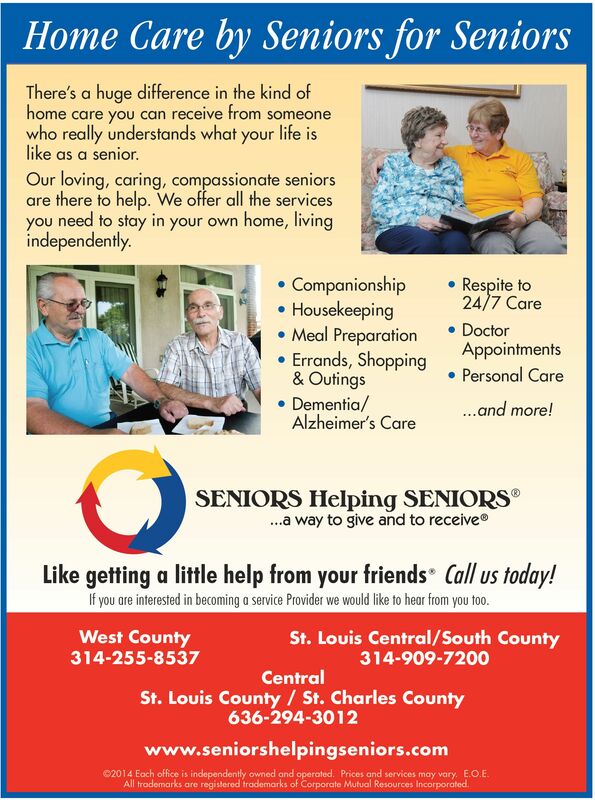 This free service is offered at Lutheran Senior Services, The Village at Mackenzie Place. 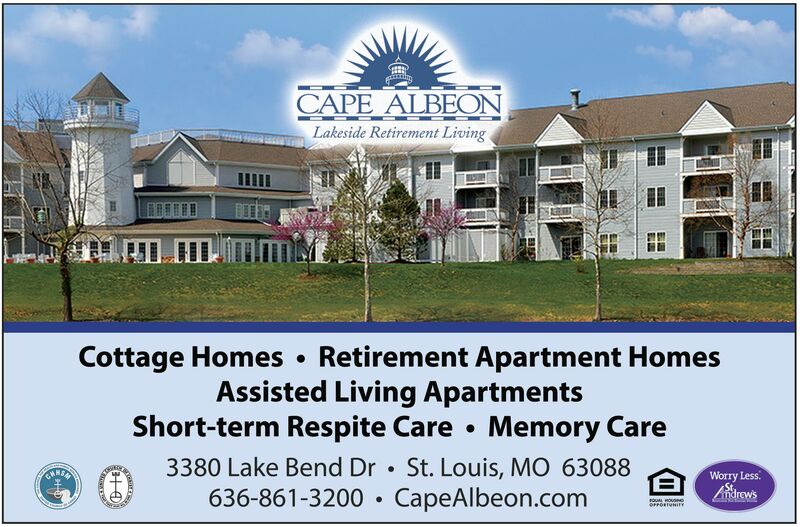 Located at 8520 Mackenzie Road, Affton, MO 63123, on Wednesday from 8:30 a.m. to 4:00 p.m. 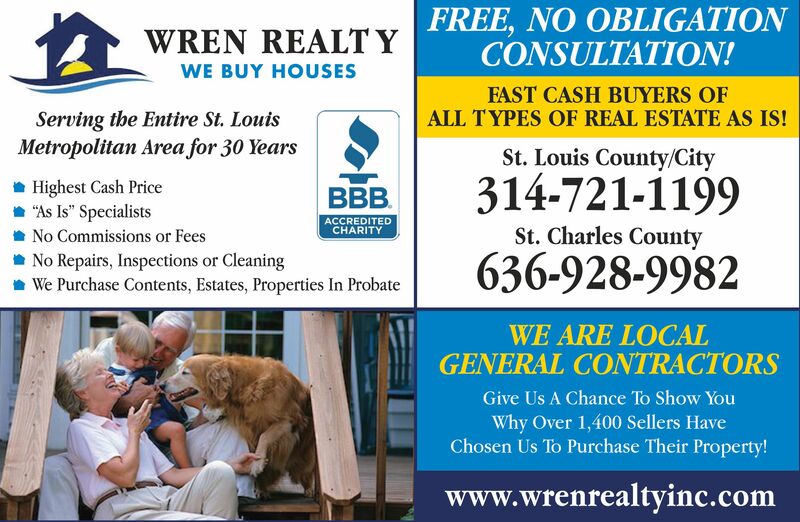 Call 314-884-7909 for times and more information. 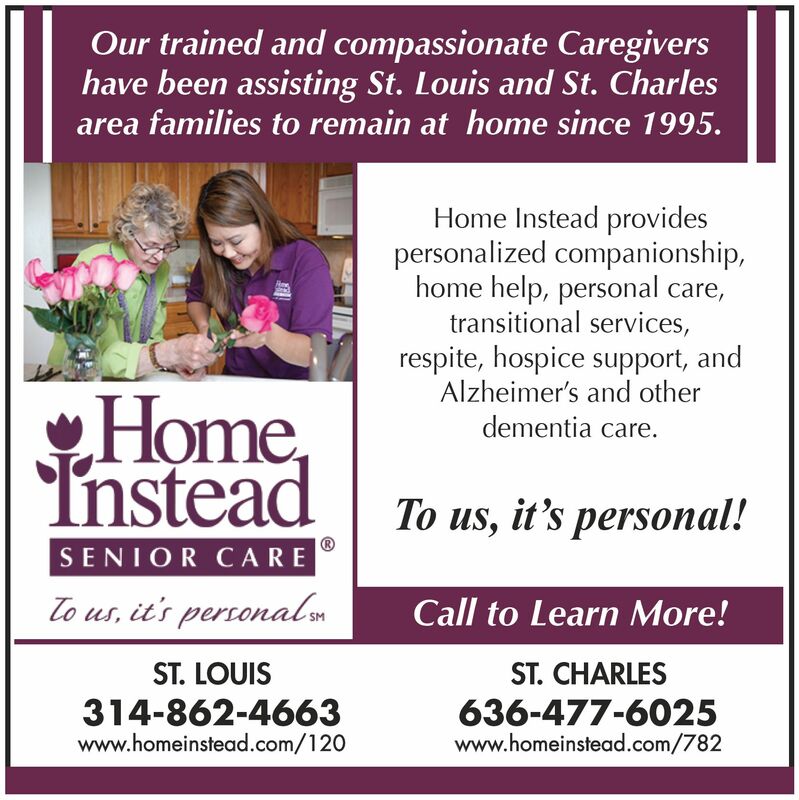 Free monthly caregiver class available to the community. 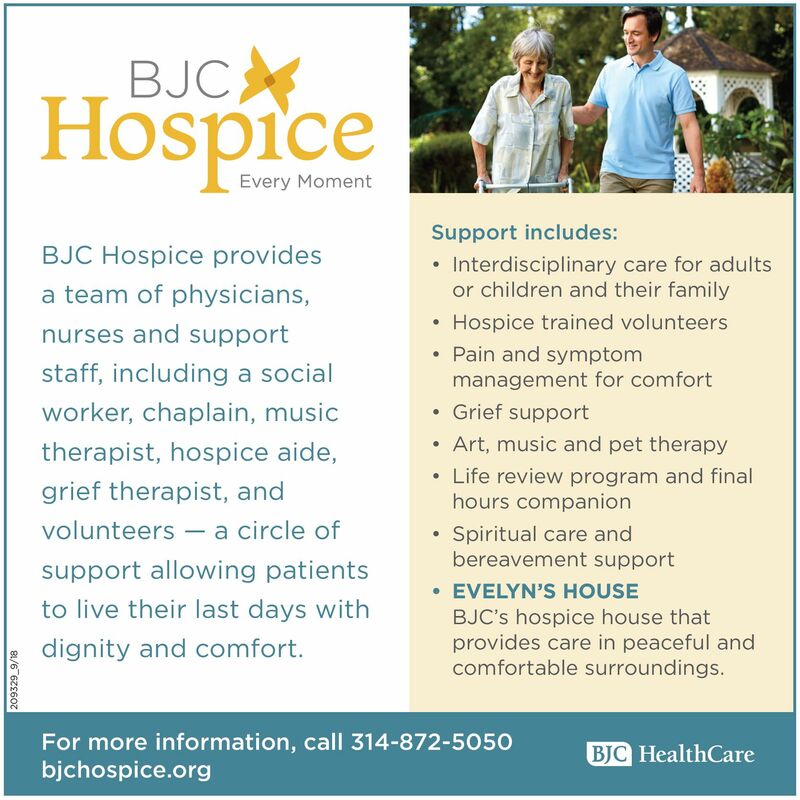 These classes are offered by Heather Bell, BJC Palliative Care Social Worker. 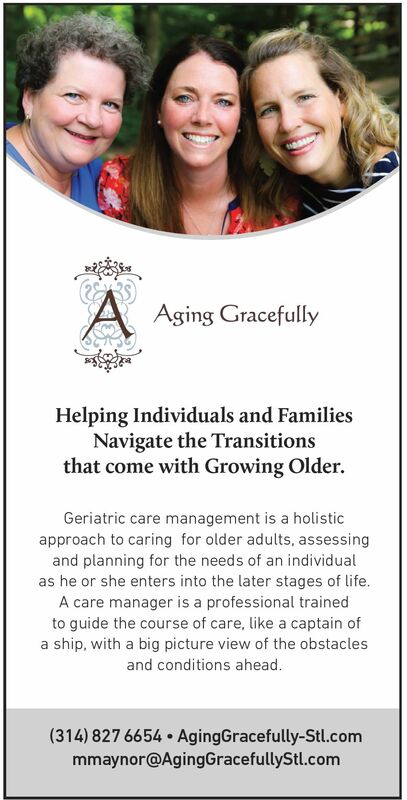 Classes cover a variety of topics meant to provide useful information and caregiver support. Class meets on the second Tuesday of the month. 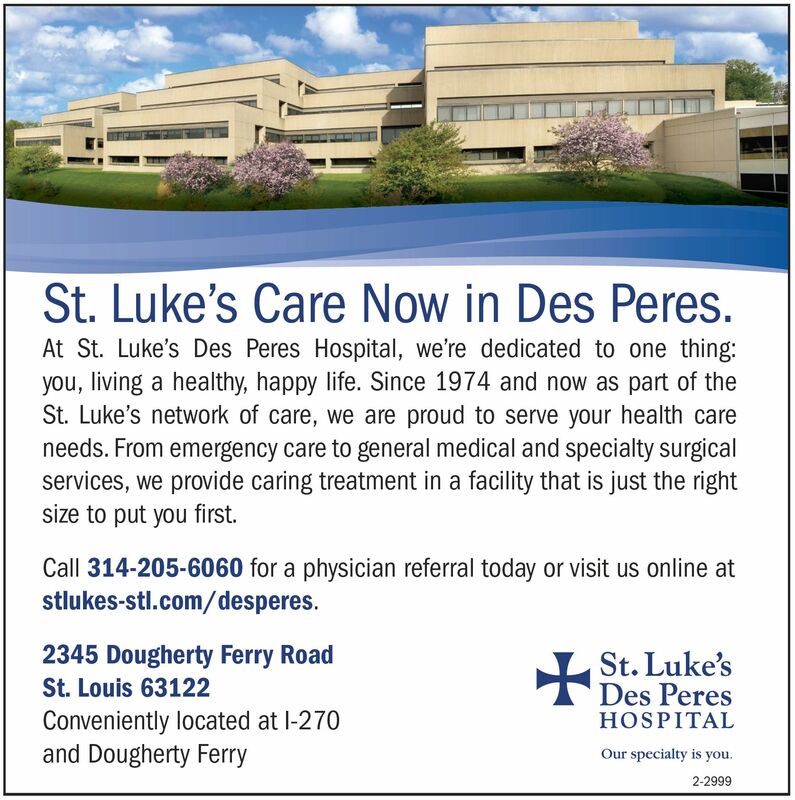 From 1:00 p.m. to 2:30 p.m., at Missouri Baptist Medical Center, Auditorium 1, 3015 N. Ballas Rd, St. Louis, MO 63131. 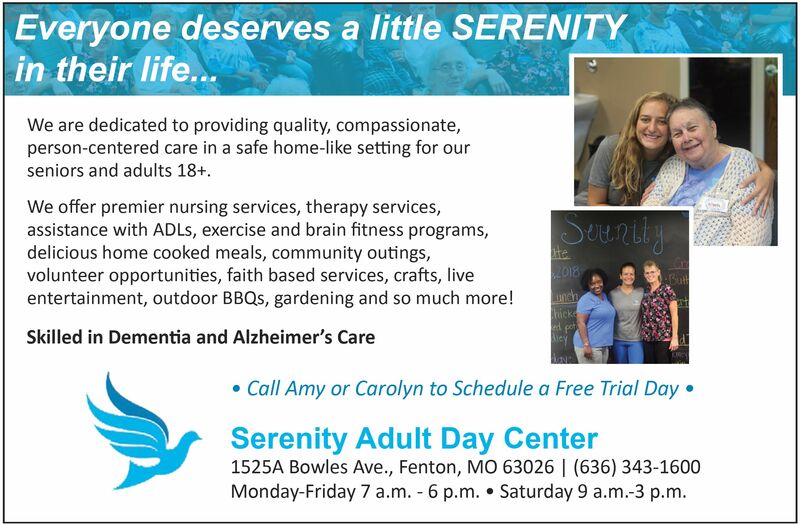 For additional information, please contact Heather Bell, 314-575-9305. These classes are free to attend. To register, please call 314-996-5433. 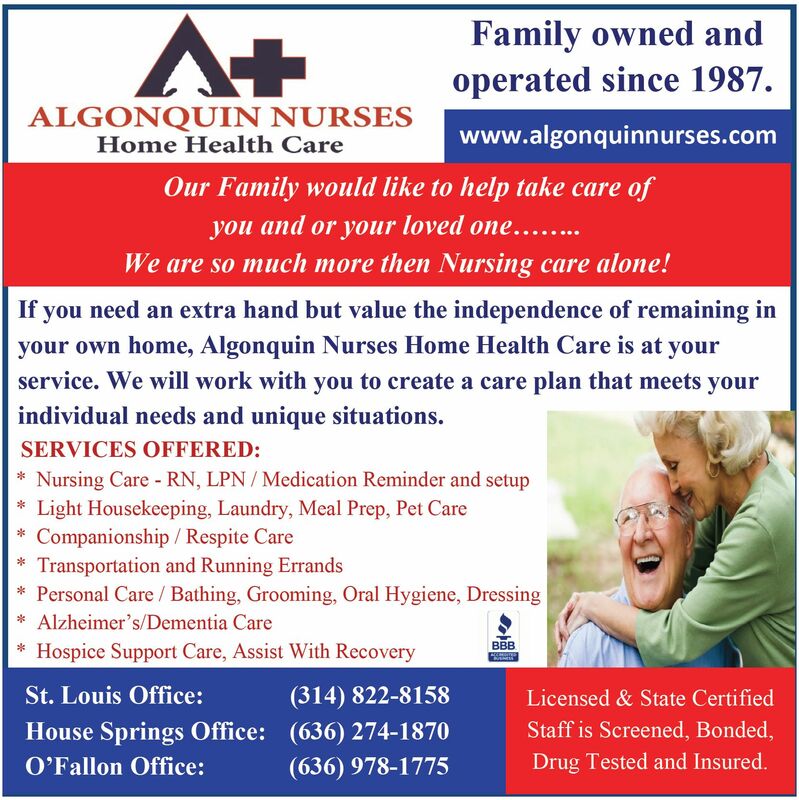 Health care professionals will provide helpful advice in providing daily home caregiving, including a registered nurse and a rehab therapist. 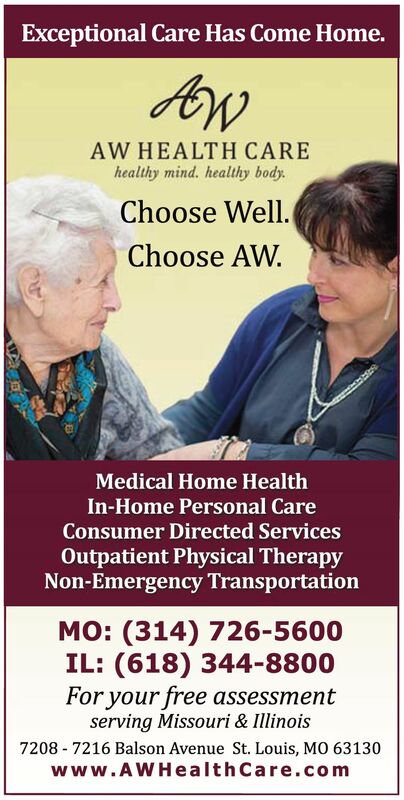 Learn about the difference between insurance-approved skilled home care and other home care choices, including private duty, home medical equipment, supplies, and other resources to help in the care of your loved one. 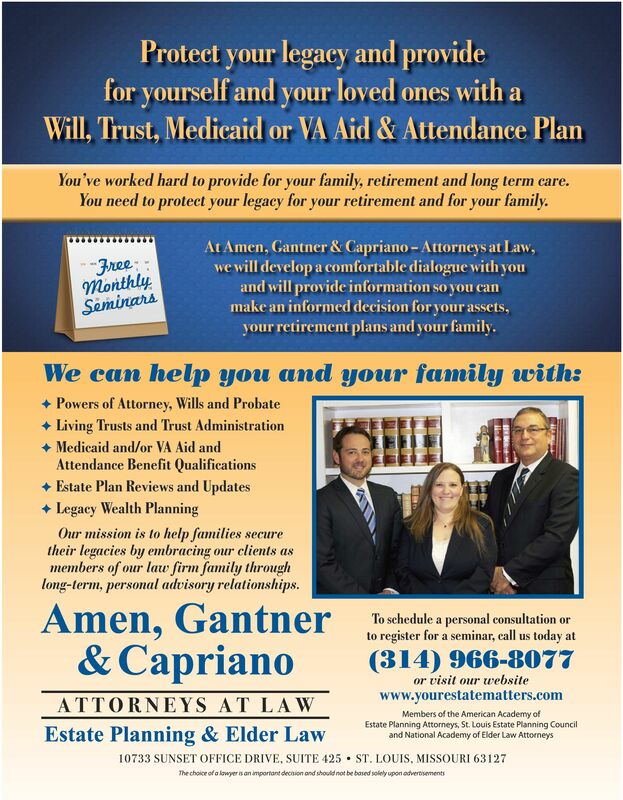 An attorney will present information on important legal matters to address with your loved ones. 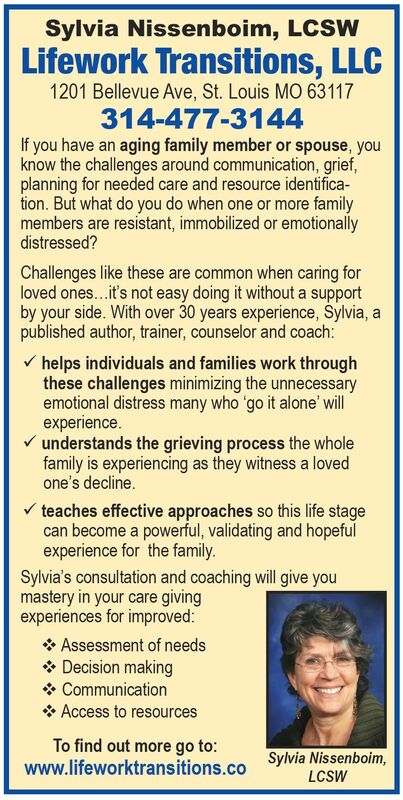 A palliative social worker will share ways to discuss goals of care and long-term planning. 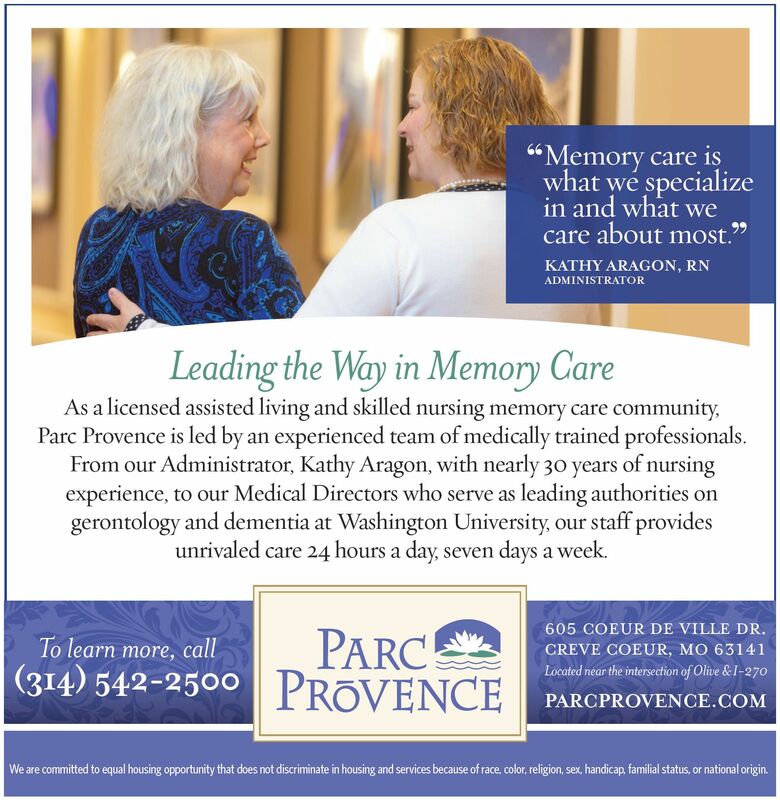 Advance Directives will be discussed. There are many ways to cope with stress and different therapies will be discussed, such as music therapy, massage therapy, pet therapy, and more. This will be an experiential class, with enough room for personal questions and needs. For women forty and older, please call to set up your free fitness consultation. Christine will sit down with you and listen to what you would like to do to feel and look better. Please don't let knee or back issues keep you from activity you enjoy as a part of your life. 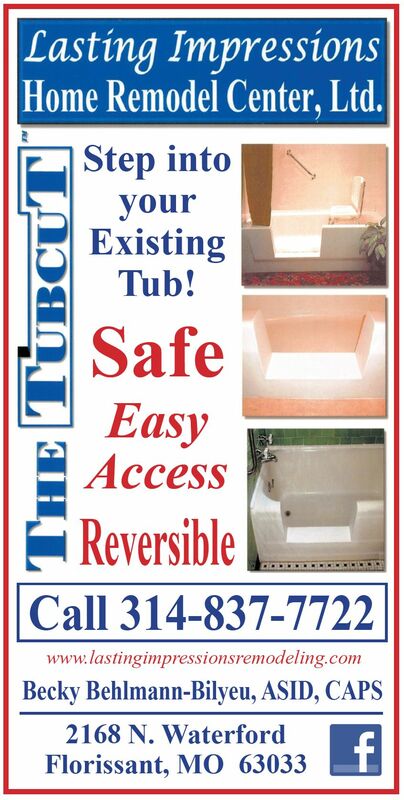 Please call Christine at 314-541-3556. It will only take 30 minutes. Located in Fenton. 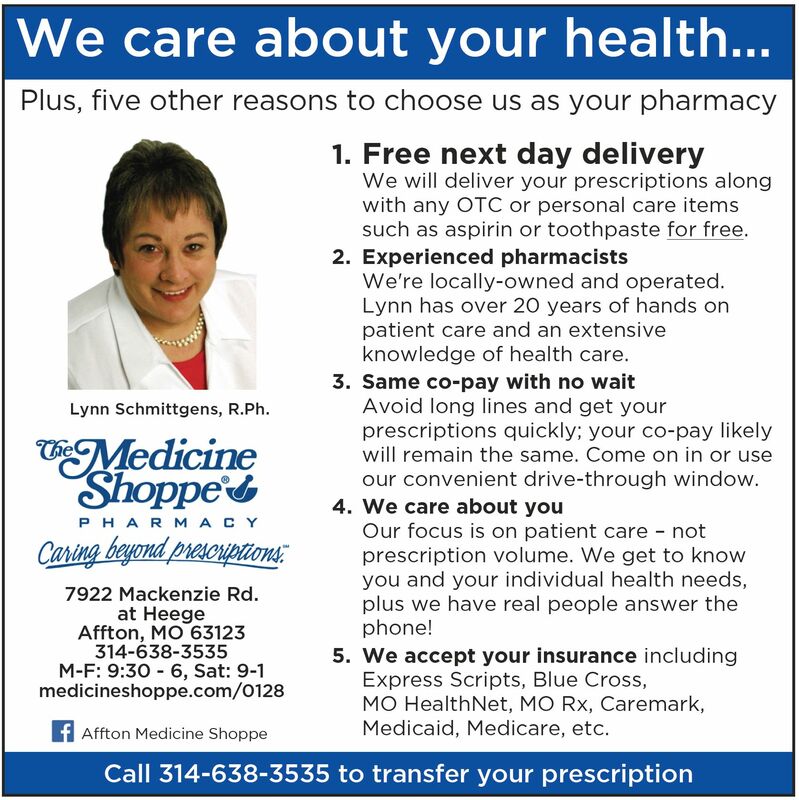 Wednesdays – 8:30 a.m. to 4:00 p.m.
Insurance information is not needed. Measure your blood pressure, weight, blood sugar levels, and pulse. 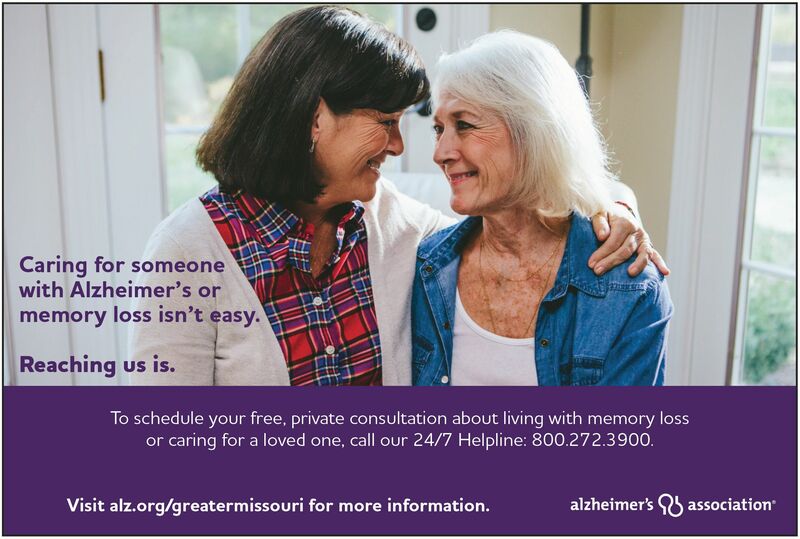 This free service is offered at Lutheran Senior Services, The Village at Mackenzie Place, 8520 Mackenzie Road, Affton, MO 63123 on Wednesday from 8:30 a.m. to 4:00 p.m. 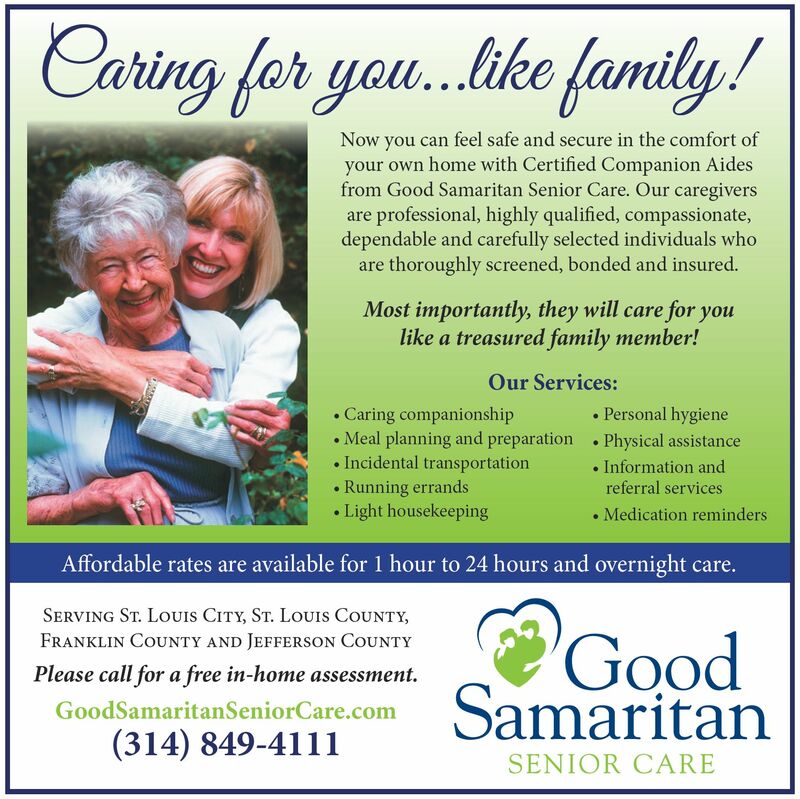 Call 314-884-7909 for times and more information. April 16 – 10:00 a.m. Announcing 41st annual National Genealogical Society Family History Conference: Journey of Discovery. 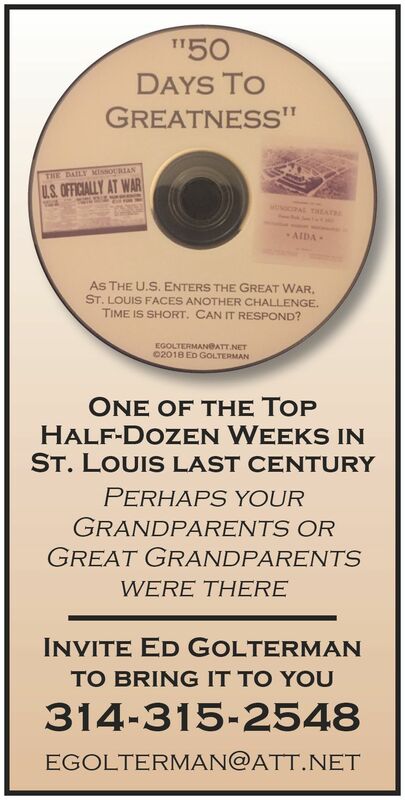 Local host: St. Louis Genealogical Society. More than 150 unique lectures on topics ranging from DNA testing, military and land records, vital records, technology for genealogy, maps and census records technology for genealogy and much more. Full day researching Irish roots and African American ancestry. Free entrance to more than 70 exhibits and vendors with free public parking. Online registration ends 19 April. Walk-in registration until sold-out. Conference location: St Charles Convention Center; One Conference Plaza Center; St Charles, MO 63303 register at www.conference.ngsgenealogy.org. On Tuesday, April 23, join Chesterfield Historic and Landmarks Preservation Committee to learn about life in Chesterfield between 1850 and 1930. Including a discussion on some of the postal villages which make up present day Chesterfield: Lake, Bellefontaine, Chesterfield, Gumbo and Bonhomme. Learn about the post office, church, school, businesses and leading citizens for each village. 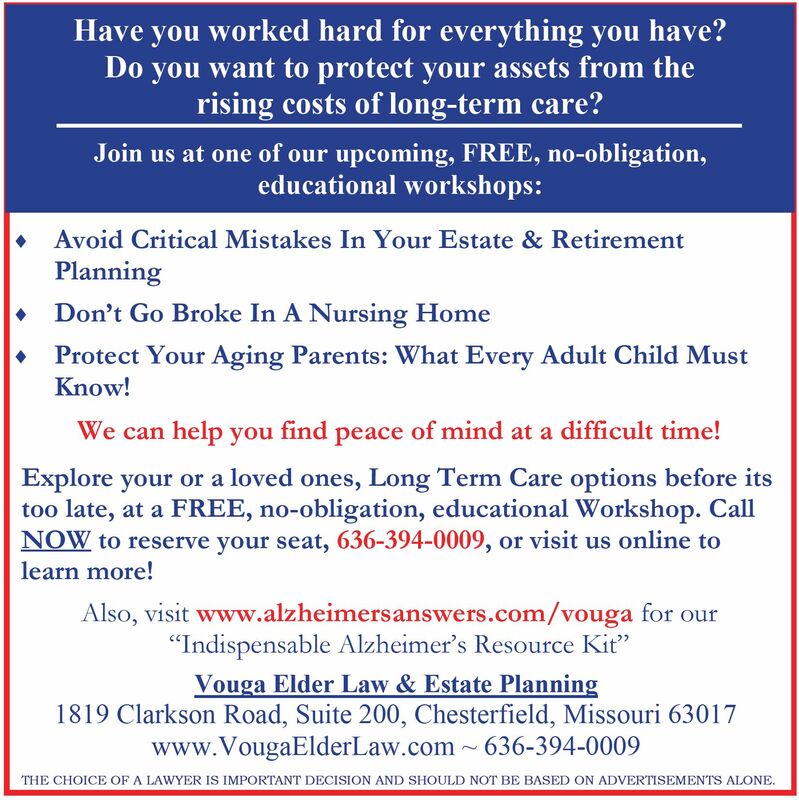 April 23 – 2:00 p.m.
How to find funds to pay for rising long-term care costs. Seminar scheduled for Tuesday, April 23, 2019 at 2:00 p.m., with wine and chocolate to follow. 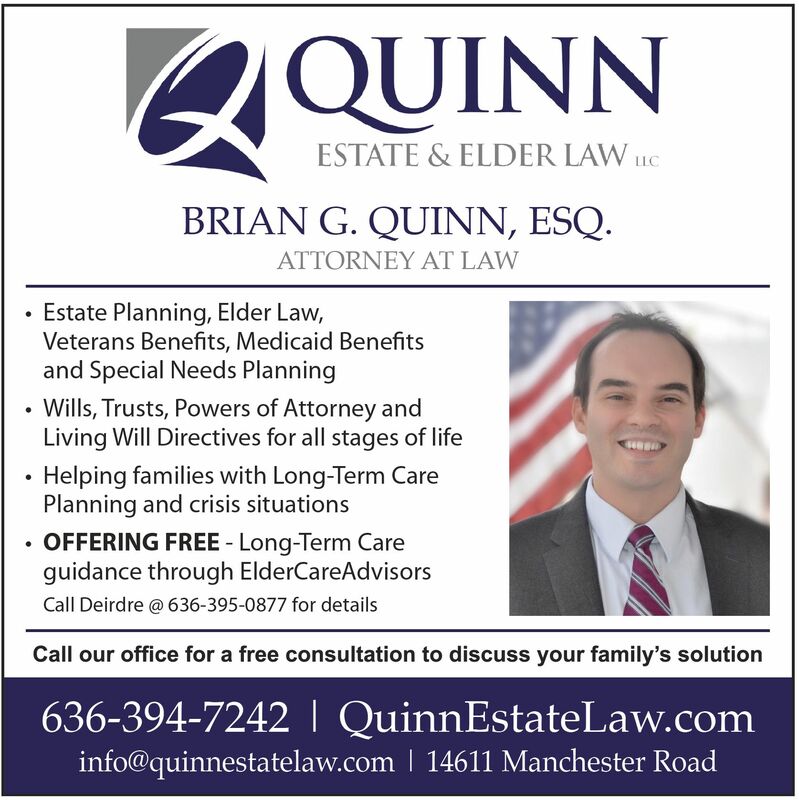 Partnered with Beck Estate Planning and Elder Law. 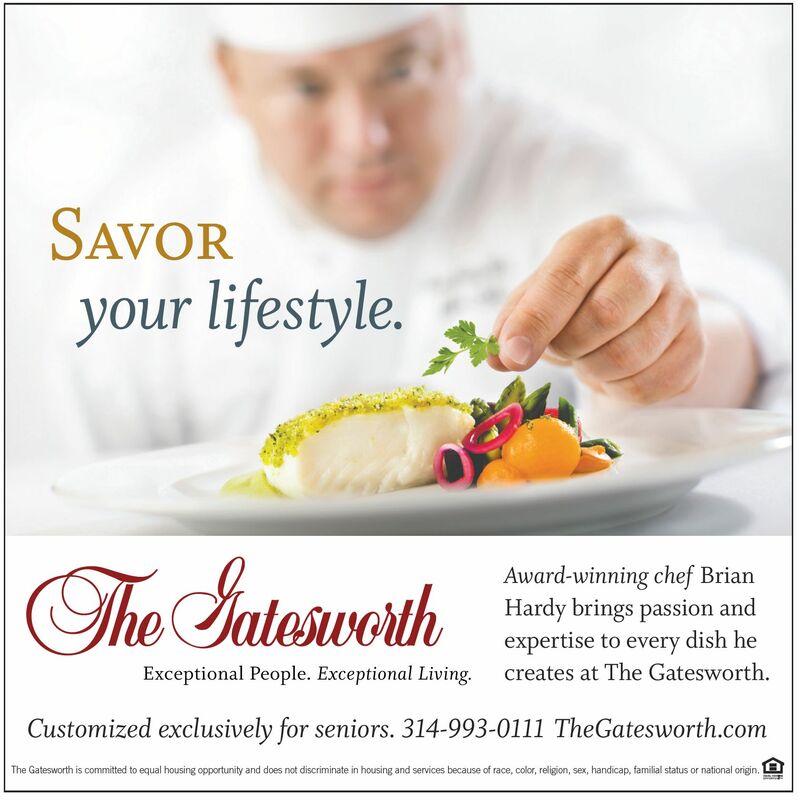 Please call 800-454-8201 to make a reservation today. Learn how to find funds to pay for rising long-term care costs. 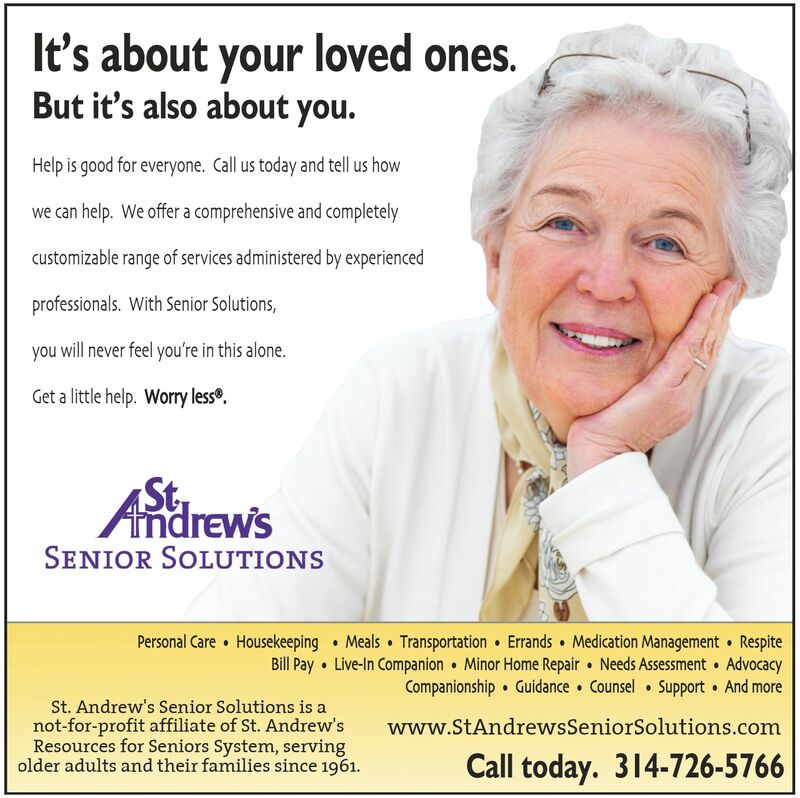 With the rising costs of long-term care, many people worry about paying for care that they or a loved one needs. Attendees at our workshops cite their first concern, outliving their money. Others are worried that they will not be able to leave any of their hard-earned savings to their children and grandchildren. 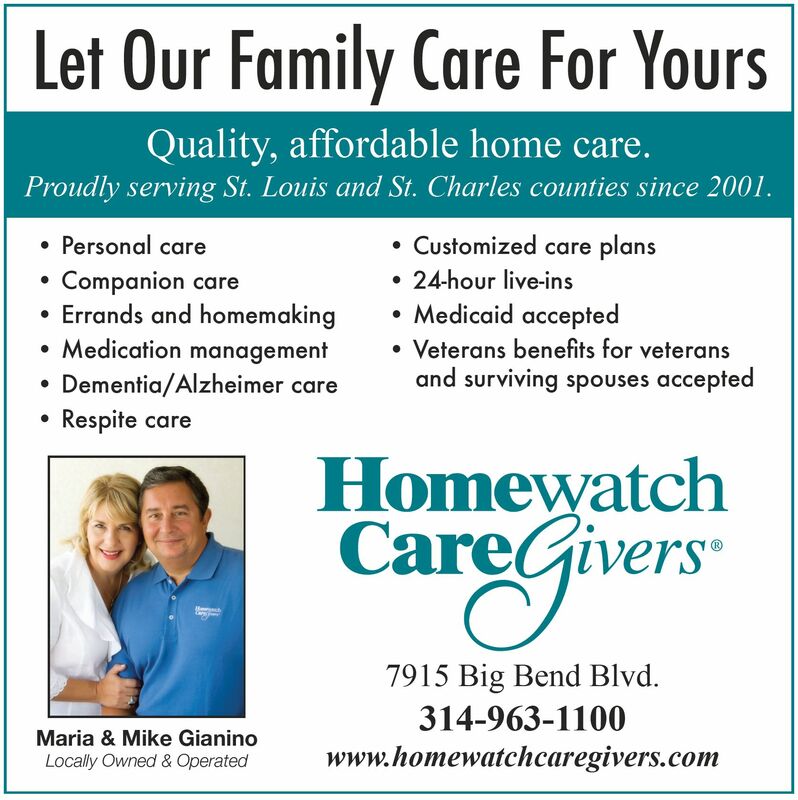 Fairwinds River’s Edge 600 River’s Edge Drive St. Charles, MO 63303 636-754-2317. April 24 – 9:00 a.m. to 11:30 a.m. The 19th annual Friedman Lecture and Awards addresses topics related to aging and recognizes contributions to the care of older adults. Washington University Chancellor Mark Wrighton will present the keynote, Advancing Aging Research and Education at Washington University: Preparing for Longer, Productive Lives. Additionally, the event will include the presentation of the Harvey A. and Dorismae Hacker Friedman Award for Excellence in Service to Older Adults and the Alene and Meyer Kopolow Award for Geriatrics, Psychiatry, and Neurology. Learn about the fascinating work in the field of aging occurring at Washington University, enjoy a compelling talk from the individual who originally championed the Friedman Center for Aging, Chancellor Mark Wrighton, and hear directly from WashU students about their experiences working and living with aging adults. At the post-lecture reception, attendees can view student posters from the Institute for Public Health's Summer Research Program, WashU's "When I'm 64" class, the Healthy Mind Lab, and the Department of Occupational Therapy. The event will be held on Wednesday, April 24 from 9:00 a.m. to 11:30 a.m. To register, please go to this web address: https://bit.ly/2OQjjLr. April 25 – 1:00 p.m. Downsizing and housing market seminar and happy hour on Thursday, April 25 - presentation at 1:00 p.m., party beginning at 2:00 p.m. Learn about the housing market from a local realtor, learn tips on downsizing and moving, and more. Following will be a fun happy hour where Scott Laytham & Karl “Trickee” Holmes will perform and we’ll have great food and drink. Please RSVP today to 636-754-2317. Fairwinds River's Edge, 600 River's Edge Dr. St. Charles, MO 63303. It's more than retirement, it's five-star fun. Please RSVP: https://slu.az1.qualtrics.com/jfe/form/SV_38WnhmmqkBdciYB. Earn 6 hours AMA/APA/Nursing - $25; 6 OT/PT - $10; 6 CE’s SW - $15 [awaiting CME approval] CE costs waived for those participating in research questionnaire; Breakfast & lunch provided Participants will be exposed to literature about current barriers to advance care planning (ACP) and quality communication about end-of-life care, in addition to information for how one’s own personal experiences of loss, death, and personal ACP may be connected to professional practices. Participants will be exposed to Narrative Medicine techniques to help guide reflection and will have the opportunity to connect to, interpret, and honor the stories of other participants as a practical example for how NM may enrich healthcare communication with patients, families and interprofessional teams. Join our panel of experts and learn who and what to watch for as you remain safe in your home. Join our panel of experts moderated by Ted Gottlieb. 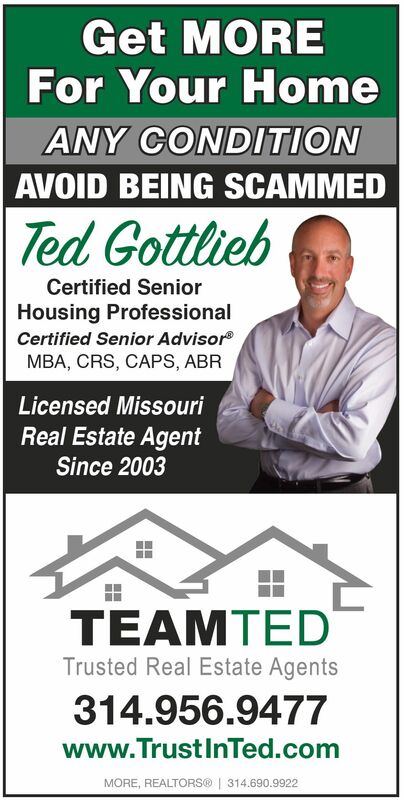 Ted is a real estate professional focused on assisting older adults who want to age in place, downsize and transition to independent and assisted living communities. He is a Certified Senior Advisor and a Certified Senior House Professional. Join panel of experts as we discuss ways that stress can impact your life and ways to make your life less stressful and maybe even stress free! Join our panel of experts moderated by Ted Gottlieb. 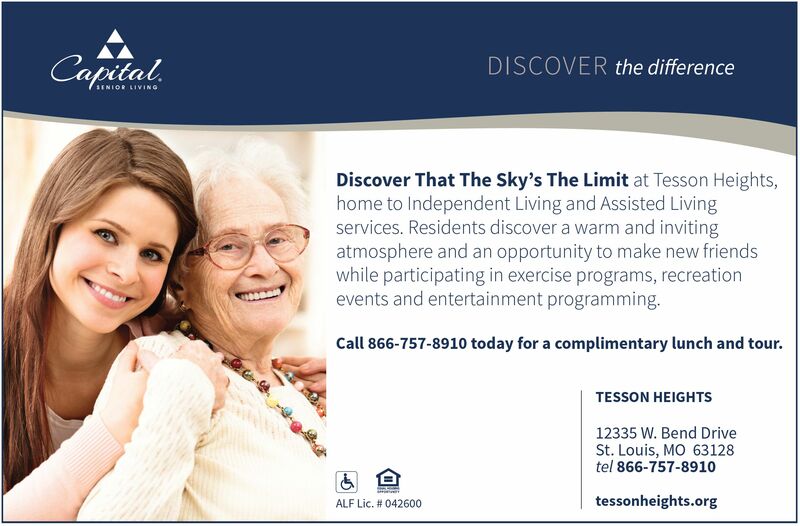 Ted is a real estate professional focused on assisting older adults who want to age in place, downsize and transition to independent and assisted living communities. He is a Certified Senior Advisor and a Certified Senior House Professional. June 13 – 8:00 a.m. to 5:00 p.m.
June 15 – 9:30 a.m. to 12:00 p.m. and 1:00 p.m. to 3:30 p.m.
Barbara Seagram, internationally recognized bridge teacher and author, is coming to the St. Louis Bridge Center to teach three bridge classes: Defensive Strategy and Teaching on Friday, June 14; and Stripping Can be Fun and Locating Opponent’s Honor Cards, on Saturday, June 15, from 9:30 a.m. to 12:00 p.m. and 1:00 p.m. to 3:30 p.m., respectively. Pricing and details are available at www.stlouisbridge.org. Oasis presents: Strike the Right Balance. Did you know? The number three reason people see their doctor is for dizziness and imbalance? Join a vestibular physical therapist to learn about your body’s balance systems while discussing strategies to decrease your fall risk and improve your balance. This fun and interactive presentation will provide insight into creating confidence in your balance to maintain an active healthy lifestyle. 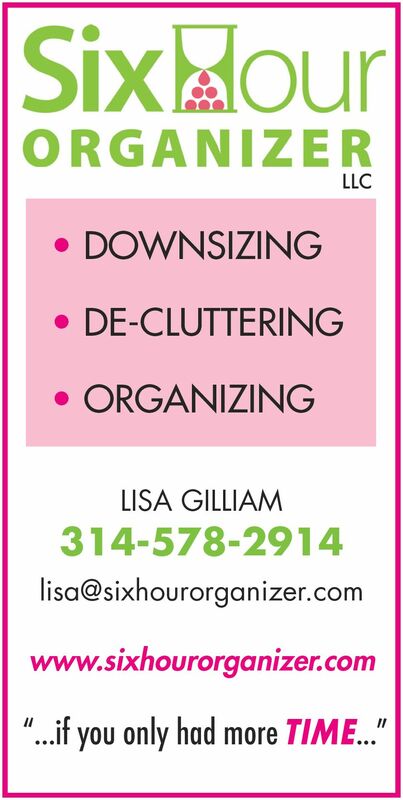 Registration required at www.stloasis.org or call 314-862-4859, ex. 24. Oasis has partnered with the city of Chesterfield to bring learning opportunities to City Hall. Classes will be held in the Council Chambers or Conference Room 102/3. To register for these classes, visit www.oasisnet.org/stl or call 314-862-4869. 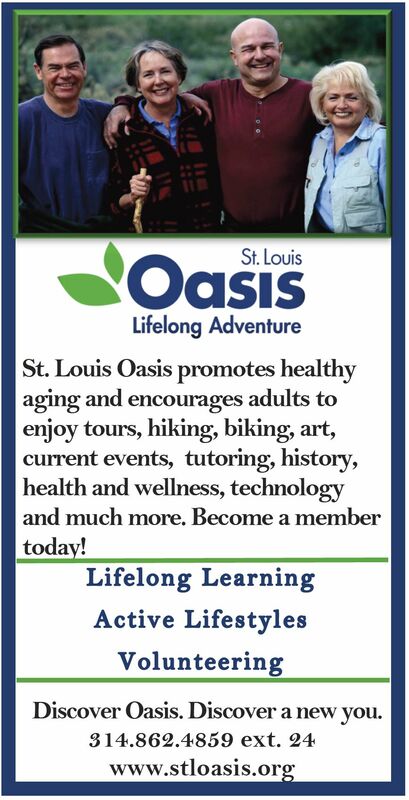 To register for the Oasis programs, call 314-862-4859 x24 or visit www.oasisnet.org/STL for more information. July 13 – 8:30 a.m. to 2:30 p.m. Your Family Stories: What did they say? St Louis Genealogical Society presents master storyteller John Phillip Colletta, PhD, who will teach us to use genealogical skills to break through brick walls; turn biographical facts into real life events and use principles of good writing to weave a captivating family narrative. Includes lunch and free parking. 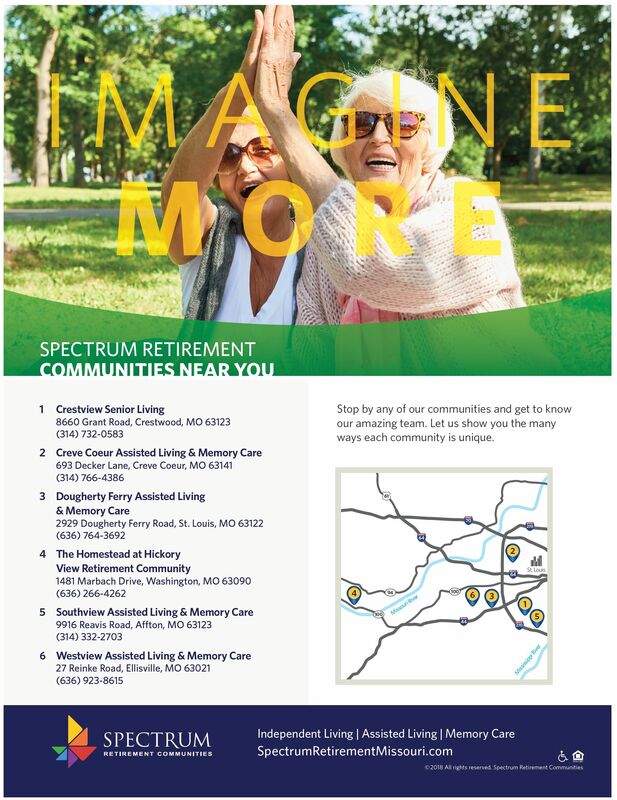 Saturday; July 13, 2019 from 8:30 a.m. until 2:30 p.m. Maryland Heights Community Center; 2300 McKelvey Road; Maryland Heights, MO 63043. Includes lunch and free parking. Register at: https://www.stlgs.org. On Tuesday, July 23, learn the facts about Medicare. Join us as we talk about the details of Medicare. To join or not to join? Bring your questions. 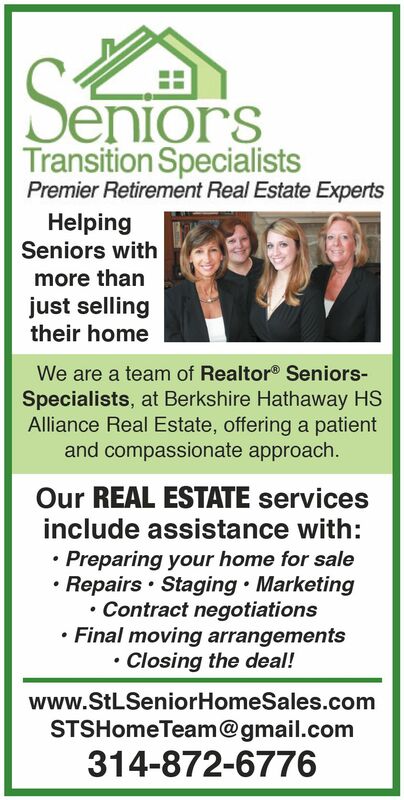 Selling your home is a team sport. Learn the "tricks of the trade" from those who know best - Real Estate Agents, Designer/Stagers, Home Inspectors, photographers and more. April 20 – 12:00 p.m. to 4:00 p.m. In honor of Cirque du Soleil coming to the Chaifetz Arena and World Circus Day, Baked Bear STL has created a special Cirque de Sandwich: birthday cake ice cream sandwiched between fresh baked fun-fetti cookies and rolled in rainbow sprinkles. On World Circus Day, at their store at 6140 Delmar Blvd, Baked Bear St. Louis will be giving away a limited quantity of these delicious Cirque de Sandwiches and Circus Harmony’s flying children will be performing in and around the store with their own exuberant circus joy. In addition to the limited supply of the free Cirque de Sandwiches all their other delightful flavors of cookies and ice cream will be available for purchase. Twenty per cent of all proceeds on World Circus Day will go to support Circus Harmony’s Flying Children Scholarship Fund. Come celebrate circus and support Circus Harmony by eating delicious ice cream sandwiches! Circus Harmony's flying children will be performing from 12:00 p.m. to 4:00 p.m., and 20% of all proceeds from other ice cream sandwiches sold that day will got to support Circus Harmony's Flying Children Scholarship Fund. Ice cream and circuses. Come join us and celebrate. April 18 – 7:00 p.m. and April 25 – 7:00 p.m.
April 18 at 7:00 p.m. Aisha Sultan will screen her film "Other People" and moderate panel discussion at Missouri History Museum theater. Free and open to public. No reservation needed. April 25 at 7:00 p.m. Beyond the Books Presidential Lecture Series featuring journalist/commentator Charles Blow at Harris Stowe State University auditorium. Opera Theater of St. Louis and St. Louis Press Club are sponsoring a free talk by journalist/commentator Charles Blow at Harris-Stowe State University. 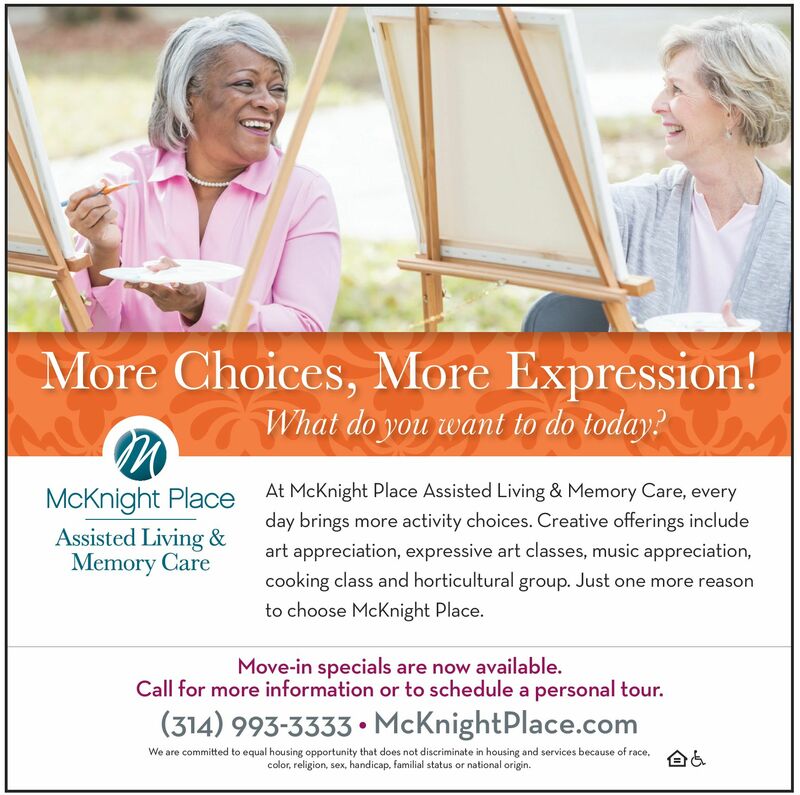 April 25 – 7:30 p.m. to 9:30 p.m. The St. Louis Banjo Club will provide a free evening of lively music played on "America's Fun Instrument - the four-string banjo". Sing along and listen to 15 banjo players playing the songs you know. The Elks Club is located at 6330 Heege Road (at Mackenzie), St. Louis, MO 63123. For more information, call 314-842-3185 or visit our website: www.stlouisbanjoclub.org. Table seating and cash bar. Snacks available for purchase or bring your own. Hamburgers, Wings, Ravioli and Fries for purchase. The music is free. Celebrating Art for Senior Engagement festival. CASEfest now in its fourth year. featuring 60+ events in ten days. Free arts programs: dance, music, visual and performing arts. For a calendar of all events www.maturityanditsmuse.org/calendar or call 314-420-1444 for more information Come be inspired. April 29 – 7:00 p.m. to 9:00 p.m.
Auditions for ComedySportz will be Saturday, April 29 from 7:00 to 9:00 p.m. at The Pat Connolly Tavern. Click on the link to register: https://goo.gl/vXRHCW (ages: 18 or older) What to expect at the audition: Participants will play some improv games and do some scene work and learn about ComedySportz. We play and practice 100 percent clean. Improv workshops are every first and third Monday night from 7:00 p.m. to 9:00 p.m. on the second floor of the Pat Connolly Tavern, 6400 Oakland, St Louis, Mo., 63139 (across from Turtle Park & the Zoo) Workshops are only $10. Tickets sold at the entrance. April 30 – 5:30 p.m.
Special Guests: Leonard Slatkin, Olga Kern, Vladislav Kern, Marlo Thomas Olga and her son Vladislav will be performing The Carnival of the Animals. Marlo Thomas will be narrating beginning at 5:30 p.m. with Cocktails, dinner at 6:30 p.m. and concert at 8:00 p.m. Concert Proceeds from the evening will benefit RAF-STL and its mission to support classic music radio programming, the arts and cultural institutions within the St. Louis community. A variety of ticket and sponsorship packages are available. May 1 - 10:30 a.m. to 11:30 a.m. Maturity and Its Muse presents The Silver Stages Series: Wednesday, May 1, Norma’s Syncopated Seniors Aged 55-91…this group of seniors didn’t want to give up living because they were retiring…come see them tap dance their way into your heart. “A not to be missed show!” E. Desmond Lee Auditorium, The Missouri History Museum Doors Open: 10:00 a.m., with performance at 10:30 a.m. Admission is free (handicapped accessible). 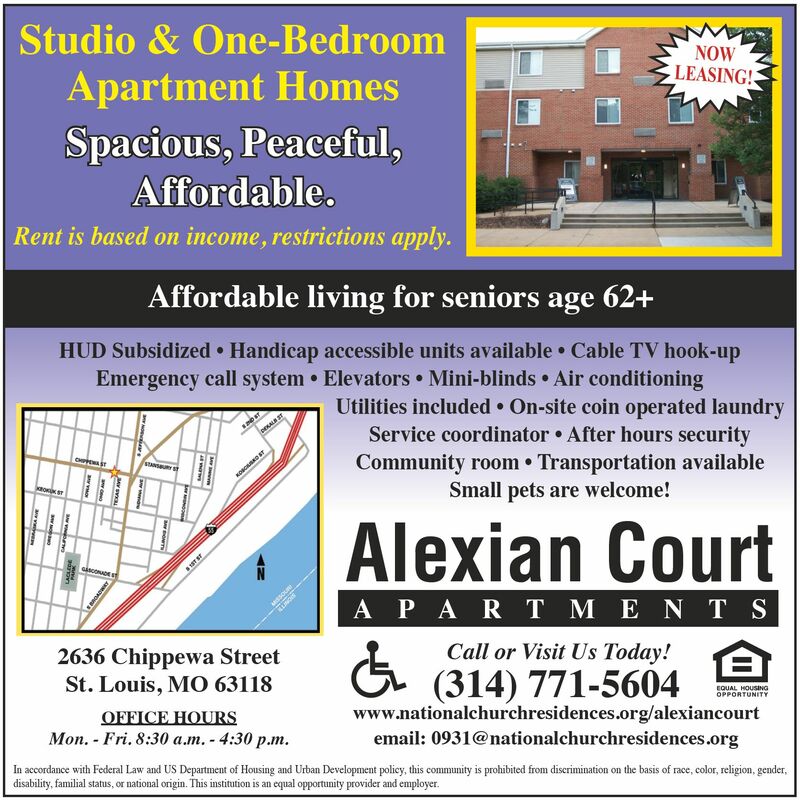 For information: Lynn Hamilton 314-420-1444 lynn@maturityanditsmuse.org We are “Making St. Louis a great place to artfully age. Craft Alliance Center of Art + Design announces that celebrated St. Louis television personality Karen Foss will be the Honorary Chair and Emcee of this year's Makers Ball. Karen Foss, winner of six Emmy awards, left the anchor desk of KSDK in 2006 after 27 years on air. Currently residing in Santa Fe, New Mexico, she remains passionate about the arts, and will be returning to St. Louis to emcee the longtime St. Louis nonprofit’s annual gala. Foss is sure to help bring the heat at Makers Ball, matching this year’s scorching theme "On Fire!" Featuring live flaming and sparking demonstrations by local craft artists, live and silent auctions, and more hot surprises, the Makers Ball is sure to be a fiery spectacle and a night of ignited passion. At the forefront of arts education in the region, Craft Alliance provides the community with access to opportunities for creative expression. Makers Ball is a unique opportunity to explore the breadth of Craft Alliance’s programming, the depth of their commitment, and the joy that arts education brings to St. Louisans of all ages. The event will be held May 3rd at the Four Seasons. Tickets are available at www.craftalliance.org/makers-ball. May 16 and July 18 – 6:30 p.m.
Free Orchestra Music Series. Come join and experience some of our Local Orchestras. At 6:30 p.m., the St. Louis Civic Orchestra performs May 16 and Gateway Festival Orchestra performs July 18. May 17 and May 18 – 4:30 p.m.
An amazing two-day outdoor bluegrass festival featuring Trampled by Turtles, Railroad Earth, The Infamous Stingdusters, Steep Canyon Rangers, Jeff Austin Band, Lindsay Lou, Pert Near Sandstone, and more. May 24 – 2:30 p.m. 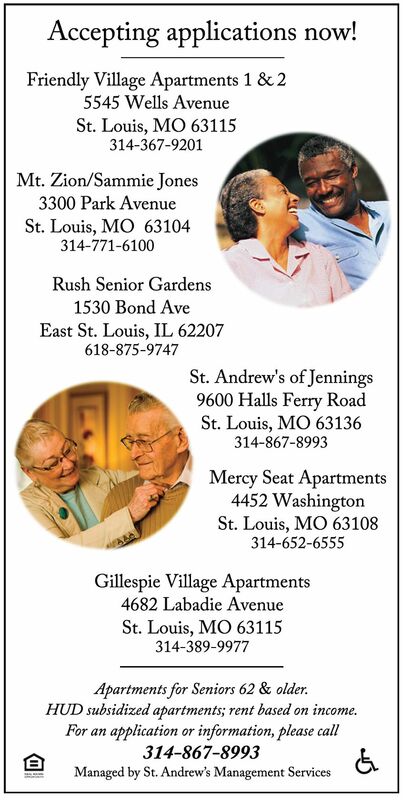 The St. Louis Bridge Center, in cooperation with the Jewish Community Center, is again hosting the bridge event of the Senior Olympics, open to all over the age of 50. The bridge competition will begin at 2:30 p.m. on Friday, May 24. Pre-registration is required. For more information, go to www.stlouisbridge.org. Chesterfield Wine and Jazz Festival at the Chesterfield Amphitheater Saturday, June 15 $5 at the door The Chesterfield Wine & Jazz Festival showcases the best in contemporary, straight-ahead and fusion jazz. Featuring Grammy award winning drummer and bandleader Dave Weckl returns home to St. Louis with his all-star band including keyboardist Jay Oliver, bassist Tom Kennedy and saxophonist, Gary Meek. Sounds of Summer Concert Series at Chesterfield Amphitheater beginning at 6:00 p.m. This event is free. The Traveling Salvation Show on June 8, Rattle and Hum KC on June 22, King of Pain on July 13, Billy the Kid on July 27, The Big Rigs on August 10, and Dogs of Society on August 25. June 21 – 9:00 a.m., 1:00 p.m. and 6:00 p.m. 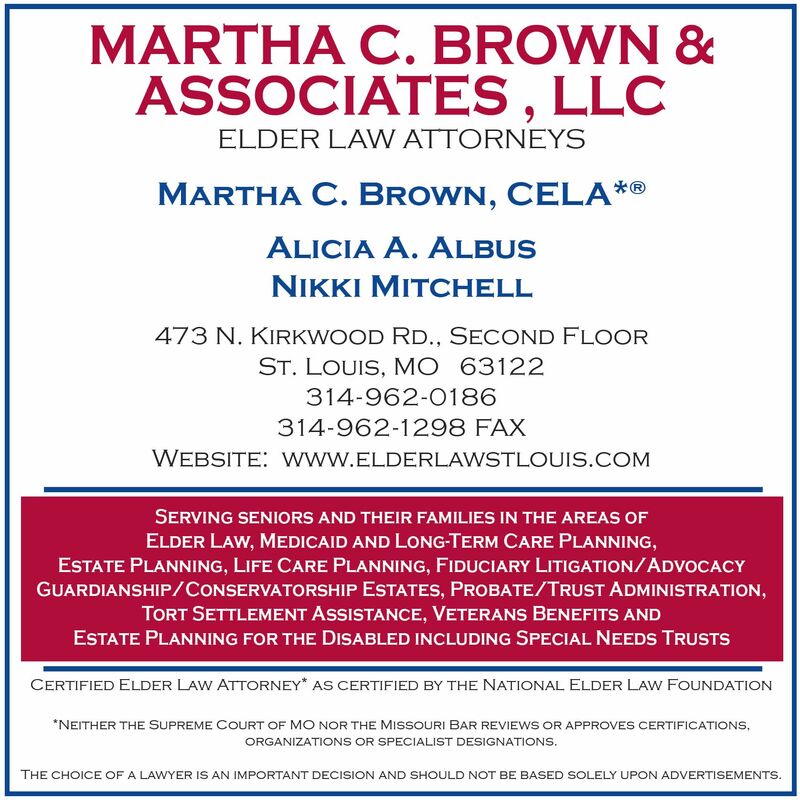 The St. Louis Bridge Center, a nonprofit organization, will host a full day of bridge activities, open to all, to raise money for the Alzheimer's Association on June 21, 2019. The goal is to top the $70,000+ raised last year. 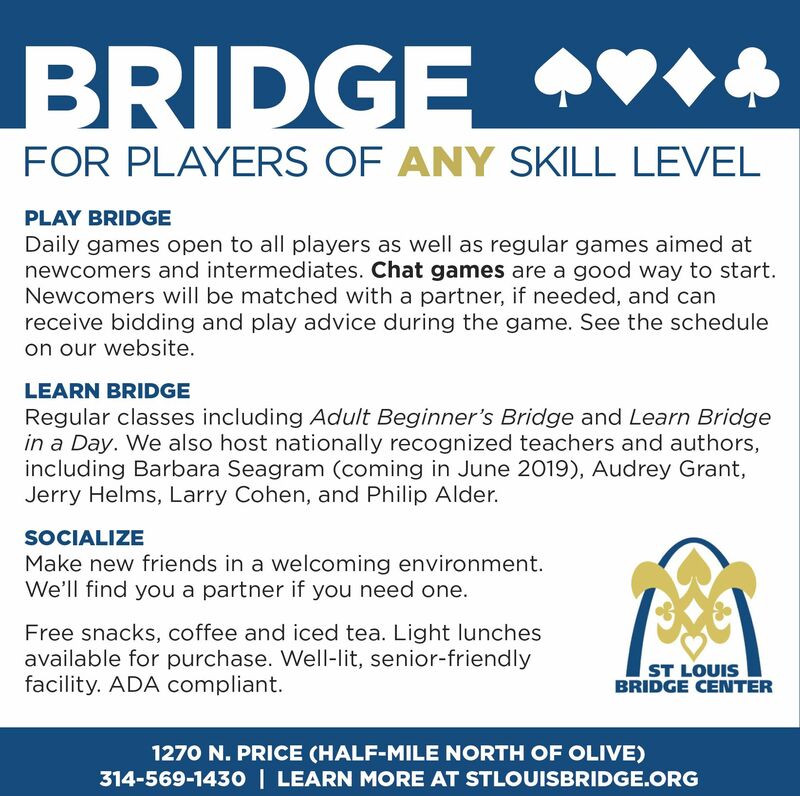 Open and novice bridge games will be held at 9:00 a.m., 1:00 p.m. and 6:00 p.m. Events also include an extensive silent auction. June 28 – 6:00 p.m.
Friday, June 28 at 6:00pm Come celebrate the hits for one night only! Three Dog Night has hits such as 'Mama Told Me (Not to Come)', 'Joy to the World', 'Black and White,' and more. Two outrageously funny teams duel it out for points and your laughs. You choose the winners… the teams provide the funny. This show is suitable for everybody. We are having shows every Saturday night at 7:30 p.m. and on the third Friday of every month. It's 100 percent clean comedy and always a blast!!! Tickets are available at the door or online at https://www.cszstlouis.com/tickets. Fridays at Fairwinds River's Edge, please join us for happy hour with live entertainment at 3:00 p.m. RSVP required: 636-754-2317. An amazing two-day outdoor bluegrass festival featuring Trampled by Turtles, Railroad Earth, The Infamous Stringdusters, Steep Canyon Rangers, Jeff Austin Band, Lindsay Lou, Pert Near Sandstone, and more. Insight Theatre Company opens its 12th season with “Daddy Long Legs.” Based on the classic novel which inspired the 1955 movie starring Fred Astaire, Daddy Long Legs is a beloved “rags-to-riches” tale of newfound love in the spirit of Jane Austen, The Brontë Sisters and “Downton Abbey.” Featuring the music and lyrics by Tony Award-nominated composer/lyricist, Paul Gordon (Jane Eyre) and Tony-winning librettist/director, John Caird (Les Misérables), it stars renowned singer Terry Barber and local favorite Jen Theby Quinn in leading roles. Ryan will direct this production with Scott Schoonover, Artistic Director of Union Ave Opera, as the Musical Director. Schoonover directs a small combo to accompany the beautiful songs that fill this production. No, we aren’t showing the Marx Brothers movie. We are performing some of the most treasured music from classical opera, arranged for wind octet. Presented by TV5MONDE and produced by Cinema St. Louis, this film celebrates St. Louis’ Gallic heritage and France’s cinematic legacy. The featured films span the decades from the 1930s through the 1990s, offering a revealing overview of French cinema. The fest annually includes significant restorations, and this year features seven such works: Pierre Schoendoerffer “The 317th Platoon,” Marcel Pagnol’s “The Baker’s Wife,” Olivier Assayas’ “Cold Water,” Jacques Becker’s “The Hole,” Jacques Rivette’s “The Nun,” Agnés Varda’s “One Sings, the Other Doesn’t,” and Diane Kurys’ “Peppermint Soda.” The schedule is rounded out by Robert Bresson’s final film, “L’argent,” and two 1969 films celebrating their 50th anniversaries: Luis Buñuel’s “The Milky Way” and Eric Rohmer’s “My Night at Maud’s.” Every program features introductions and discussions by film or French scholars and critics. The discussions will place the works in the contexts of both film and French history and provide close analyses. All films are in French with English subtitles. Tickets for all shows are on sale now through Brown Paper Tickets. Demanding Change Music for piano and strings + World Premiere. It’s time for our art form to reflect our community, which means just as much music by women as men and by people with diverse backgrounds and stories. No longer should a program of music by women be unusual, and this program features some of the best music you’ve never heard. Pulitzer Prize winner Ellen Taaffe Zwilich’s commanding and feisty Piano Quintet and Florence Price’s soulful and elegant Quartet in G will leave you wanting more from these two extraordinary women. We are thrilled commission Stephanie Berg again to add to the canon of great contemporary music. Celebrate with your neighbors Mr. Rogers’ incredible legacy as we create a space for conversation and reflection around the tragic shooting at Tree of Life Congregation in Squirrel Hill, Mr. Rogers’ real-life neighborhood. Panel discussion follows film, in partnership with the Jewish Community Relations Council and ADL Heartland. From the #1 International bestselling author of The Lost Wife and The Velvet Hours comes an emotionally charged story about a mother’s love, a teacher’s promise and a child’s heart. Katya, a rising ballerina, and Sasha, a graduate student, are young and in love when an unexpected tragedy befalls their native Kiev. Years later, the consequences of this incident cause their son, Yuri, to be born with a rare health condition that isolates him from other children. Maggie, a passionate and dedicated teacher agrees to tutor Yuri at his home. As the two forge a deep and soulful connection, Yuri’s boundless curiosity and unique wisdom inspires Maggie to make difficult changes in her own life. Enjoy selections from popular music, Broadway, and opera, a night of amazing performances to benefit leading-edge cancer research at Siteman Cancer Center. Our tenth Anniversary Event will feature special guest host Christine Brewer. The Grammy Award-winner has been named one of the top 20 sopranos of all time (BBC Music). In this hands-on, intimate event, you are paired 1-on-1 with a horse to feed, groom, and watch the herd canter to the pasture at twilight. Bonfire, hot chocolate, smores. Only $100 for a group up to five. For an additional $10 JB Photography will be offering a keepsake photo. This will be delivered by email within 48 hours after the event. Great for animal lovers of all kinds. April 27 – 8:00 a.m.
Bird Watch/Walk on Saturday, April 27 at 8:00 a.m. This is a free event. Join members of the Audobon Society to learn all about the different species of birds on the River's Edge Trail. The walk will last two to four hours. Please note you do not have to stay for the duration. Please dress for the weather and bring binoculars. April 26 – 11:30 a.m.
You are invited to the April 26 Press Club Friday Forum (noon) and optional buffet lunch at 11:30 a.m. at Missouri Athletic Club-Downtown, 405 Washington Avenue, St. Louis. Our forum speaker, Sylvester Brown Jr. – author, community activist and former St. Louis Post-Dispatch reporter, will talk about "When Journalists Listen: The Story of a Word Warrior." Prior to his position with the Post, Brown published Take Five Magazine, an investigative regional publication, for 15 years. The publication received more than 30 awards for its investigative series, general reporting and Sylvester’s political and social commentaries. Brown also founded the Sweet Potato Project, a St. Louis-based entrepreneurial and agricultural program for urban youth. This project inspired his recently released book, “When We Listen: Recognizing the Potential of Urban Youth.” The noon forum is open to all (by reservation due to limited space). RSVP by April 24 please to info@stlpressclub.org or by calling 314-449-8029. The optional buffet lunch begins at 11:30 a.m. and is $20 for Press Club members, $23 for all others. (MAC garage parking free for lunch guests with validated ticket.) 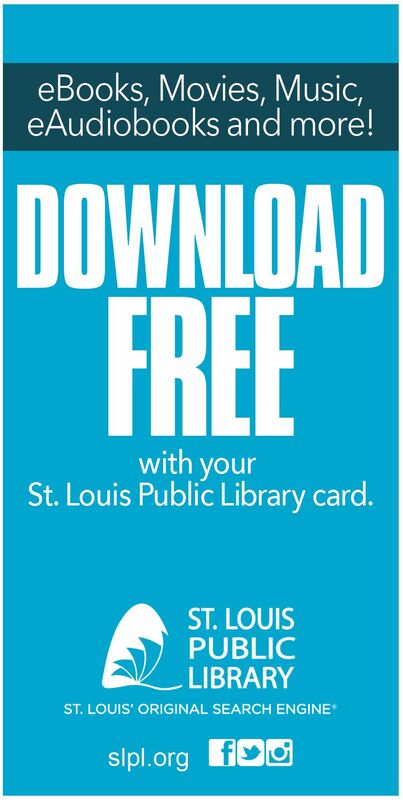 To pay by credit card go to stlpressclub.org or send check to St. Louis Press Club, PO Box 410522, St. Louis, MO 63141. 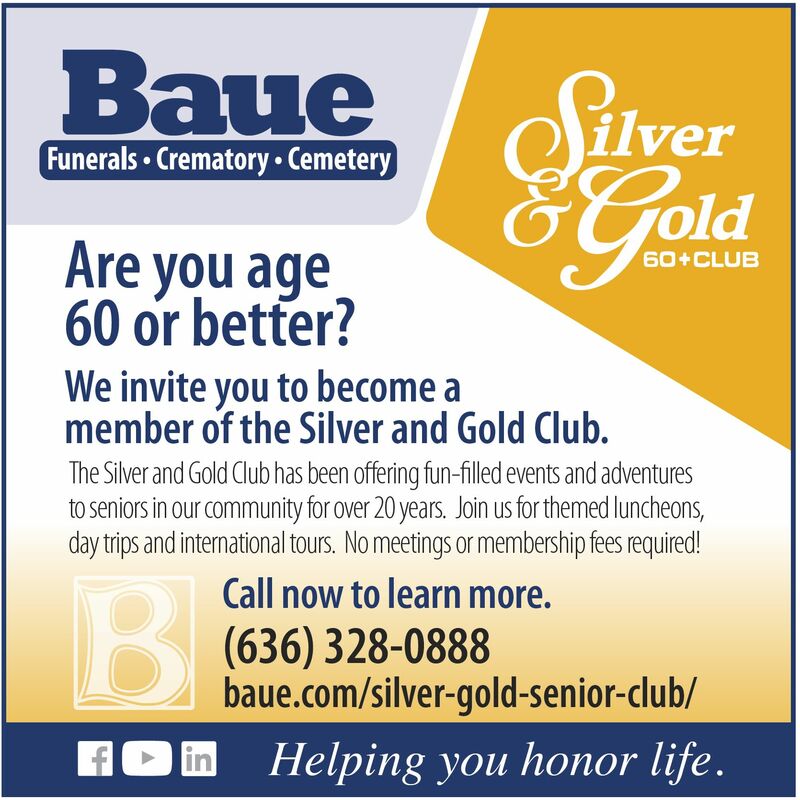 April 30 – 5:00 p.m.
Silver Haired Legislature to hold election on May 07, 2019 in Manchester, MO. Filing is now open for this year’s Silver Haired Legislature (SHL) election to be held at Aging Ahead Senior Centers on Tuesday, May 7. 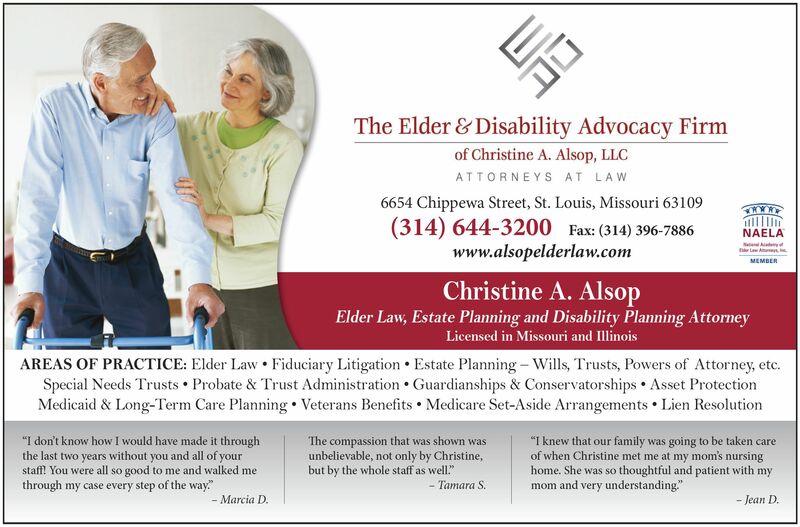 SHL is a formally elected body of citizens 60 years of age or older that promotes conscientious legislative advocacy for Missouri’s older adults. All members are volunteers who serve without pay. Seats are open in the counties of St. Louis, St. Charles, Franklin and Jefferson. 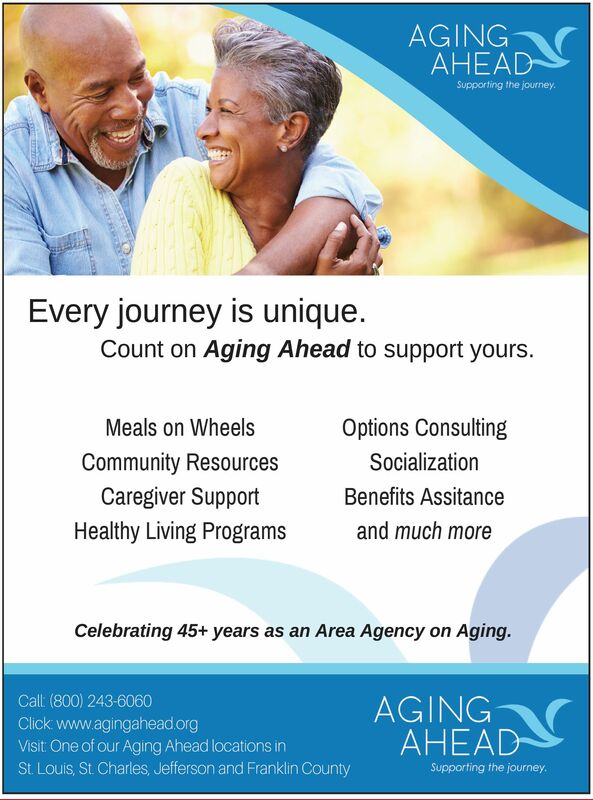 The SHL members meet monthly at Aging Ahead’s office in Manchester and hold an annual autumn meeting in Jefferson City with Missouri’s nine other SHL delegations to present, debate and vote on priority bills and resolutions. After the autumn meeting, SHL members speak to senior groups and to legislators to build support for these priority bills. 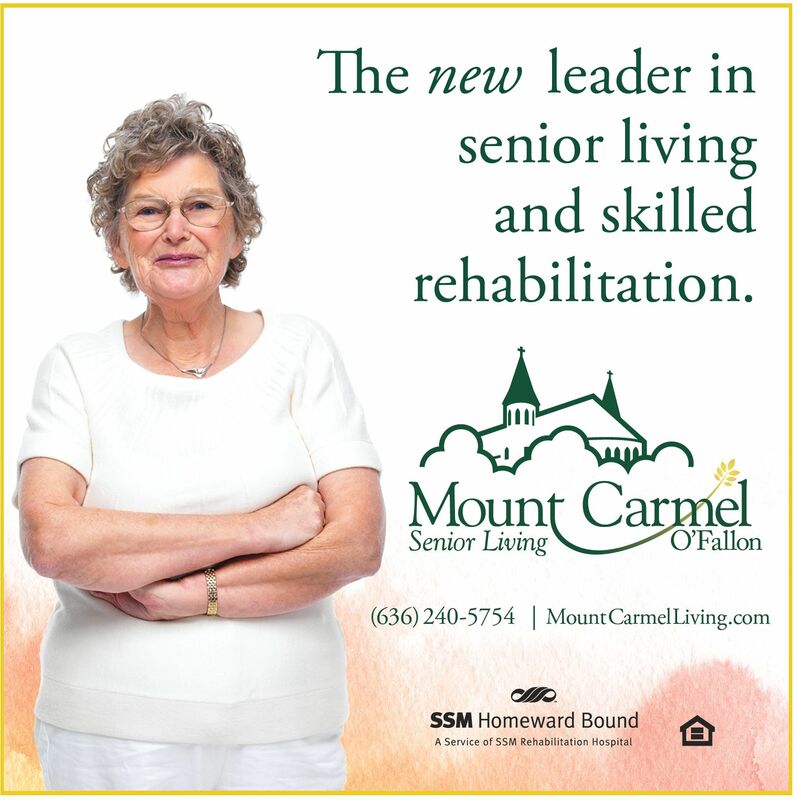 SHL past successes include helping to pass increases in funds for home-delivered meals and in-home services. The deadline to submit required application for the SHL election is 5:00 p.m. on April 30, 2019. 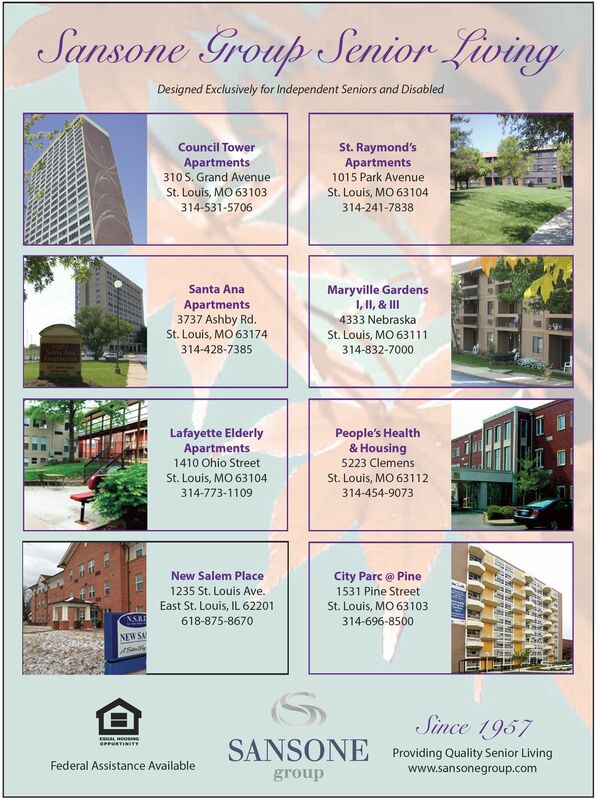 Contact Jan Keith at jkeith@mid-eastaaa.org 636-207-0847 or 1-800-AGE-6060 for filing information and documentation. Tuesday, May 21 - 2:00p.m. to 3:30 p.m. Mobile Shred Truck onsite from 2:00 to 3:00 p.m. Bring boxes of old papers to be shredded and enjoy entertainment by Fanfare with great food/drink. PLease RSVP: 636-754-2317. Fairwinds River's Edge 600 River's Edge Dr. St. Charles, MO 63303. Get involved and deliver a difference- run, walk, volunteer or become a sponsor for the Aging Ahead and Edward Jones 5K Run/ One-Mile Walk on Saturday, June 1, 2019 at Queeny Park. With this year’s event, we hope to raise awareness and critical funding to support our Meals on Wheels program. Join our special guest, Rene Knott, from KSDK who is returning as the guest race director. Gather your friends, family members and co-workers together this summer to enjoy a great morning supporting a wonderful cause. Register before May 15 to guarantee the early bird pricing. All registered runners and walkers will receive a swag bag and complimentary t-shirt. Register at www.racesonline.com/events/miles-for-meals-stl or for more information visit https://www.agingahead.org/get-involved/miles-for-meals/. 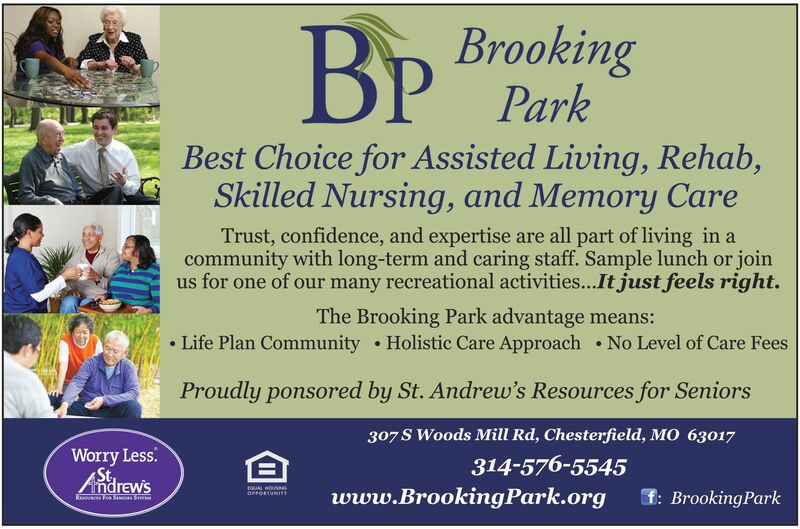 Become an event sponsor and support older adults and make a difference in the community through one of our various sponsorship options. Benefits include business materials or promotional items in the swag bag, sponsor logo on our website, and so much more. 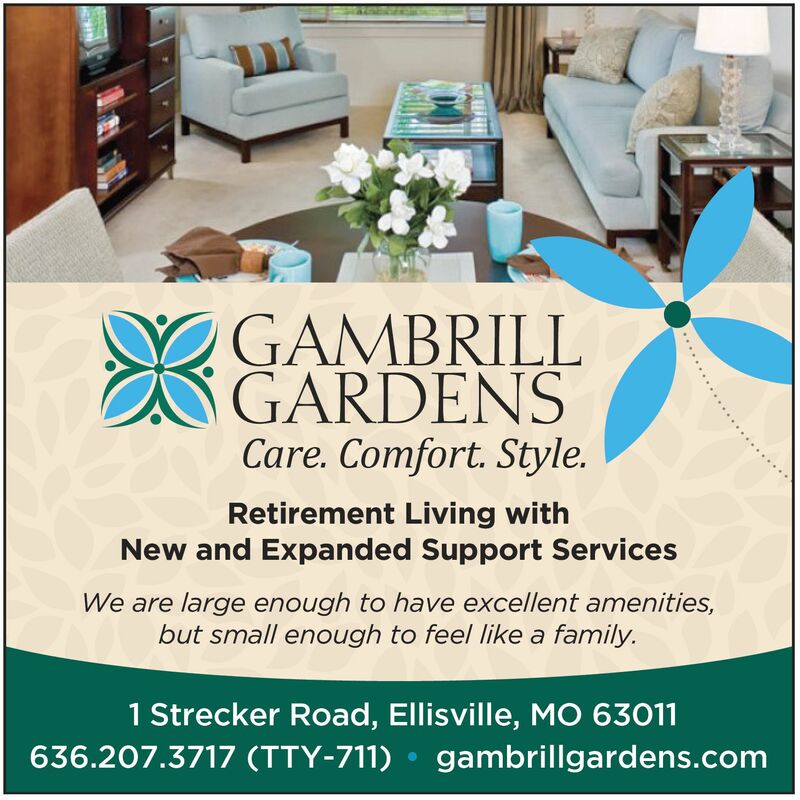 To become a sponsor contact, Amy Hummel, at 636-207-4230. August 10 – 11:00 a.m.
Print: Sarah Bryan Miller, St. Louis Post-Dispatch Music Critic and Robert Cohn, Jewish Light Editor Emieritus, Television: Dave Murray, KTVI retired chief meterologist and Spencer Koch KTVI and KPLR retired general manager and president, Radio: Carol Daniel, KMOX news anchor and reporter, and Ron Elz, KMOX program host, Public Relations: Dan Farrell, St. Louis Cardinals Senior Vice President, Sales and Marketing, and our national Lifetime Achievement awardee will be CBS reporter and correspondent, Barry Petersen. Mondays at 1:00 p.m. and Fridays 1:30 p.m.
“The Aging Answers Show” Addresses 65+ questions. 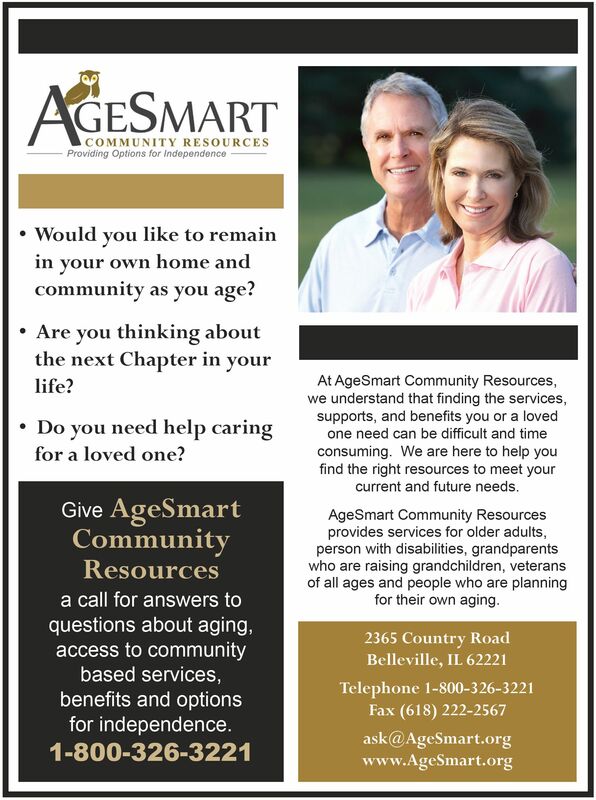 This is a new radio program recently aired addressing the current issues facing seniors. “The Aging Answers Show,” hosted by The Mary Culver Home for Visually Impaired Women, premiered April 8 on KWRH-LP, 92.9 FM. Topics will include the Medicare Maze, Importance of POAs, Choosing Your Next Move, New Devices to Keep You in Your Home and much more. The 30-minute show airs Mondays at 1:00 p.m. and repeats on Fridays at 1:30 p.m. There is also a link to hear all shows on www.maryculverhome.org/about-us. For topic suggestions contact Gina March at 314-966-6034. Founded in 1866, the Mary Culver Home provides highly personalized nursing care for women with vision impairments. 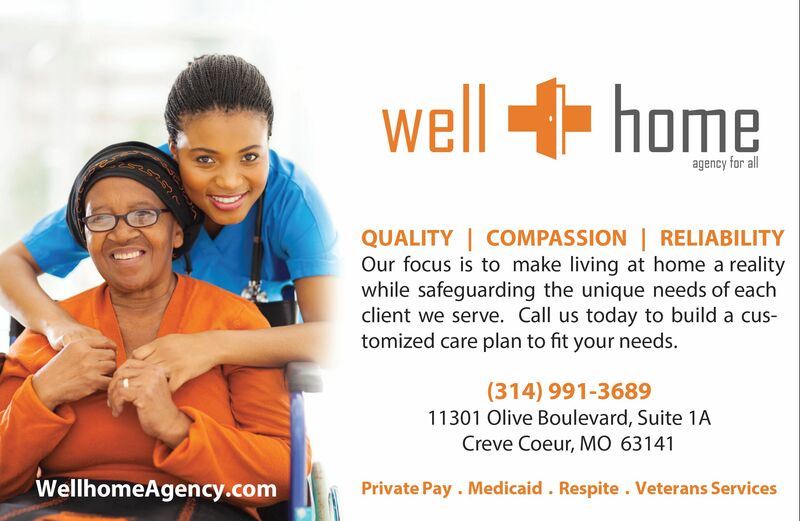 It is located at 221 West Washington Avenue, Kirkwood, MO 63122. 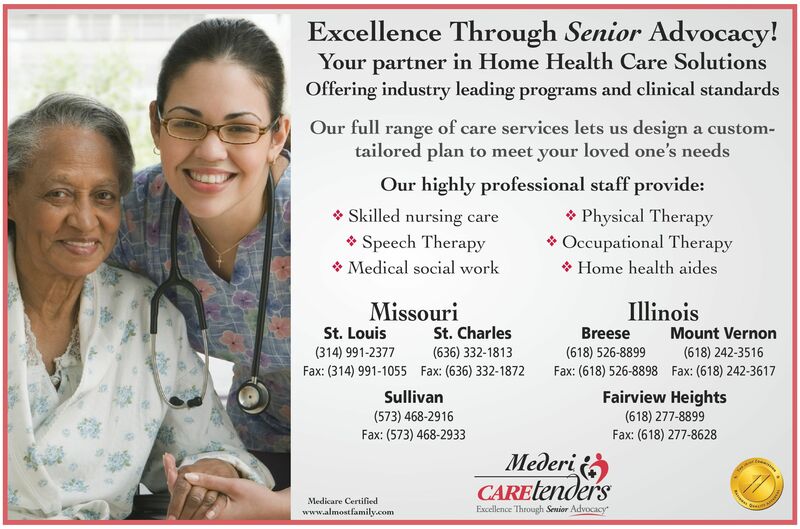 For more information, contact 314-966-6034 or visit www.maryculverhome.org. Humana Medicare Advantage Plan Addresses High Fall Rates Among Older Adults in St. Louis Humana Inc. is offering a Medicare Advantage plan in St. Louis with a fall prevention benefit. 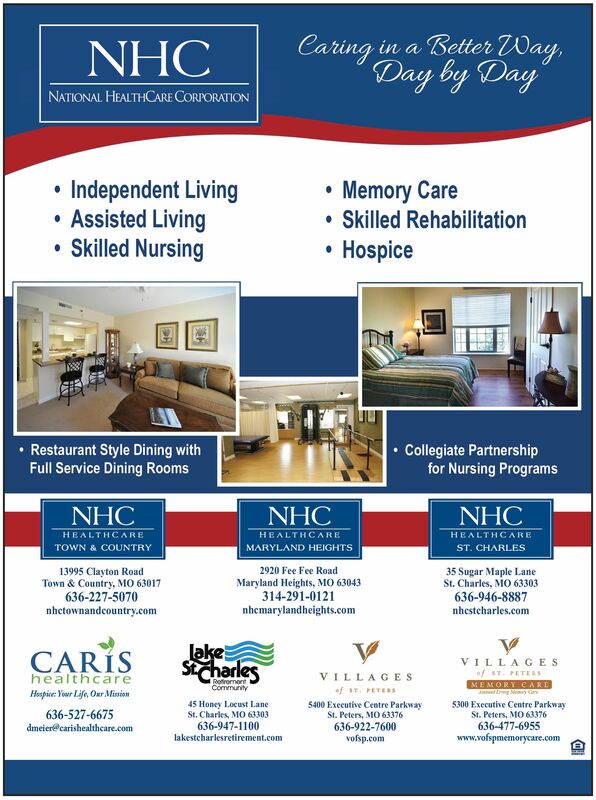 The benefit is administered by Washington University in conjunction with The Home Hazard Removal Program (HARP), a home hazard removal and fall risk intervention delivered in the home by occupational therapists to assess home hazards and reduce physical and financial burden due to falls. The program’s outcomes have demonstrated a reduction in falls during studies conducted by researchers at Washington University. 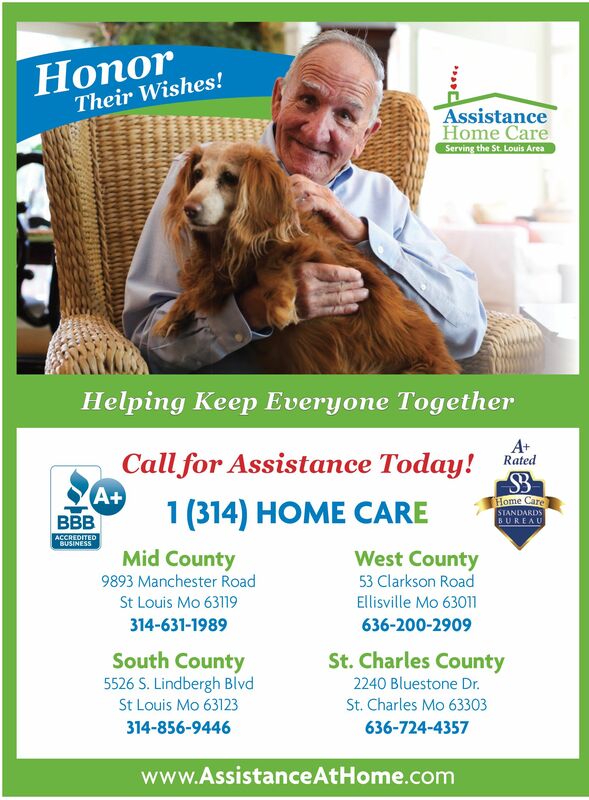 The fall prevention benefit is tailored for Medicare beneficiaries who live in St. Louis to address the high frequency of falls among this population – a dangerous and costly problem that plagues Missouri with a high rate of injury by falling, 31 percent higher than the national average. 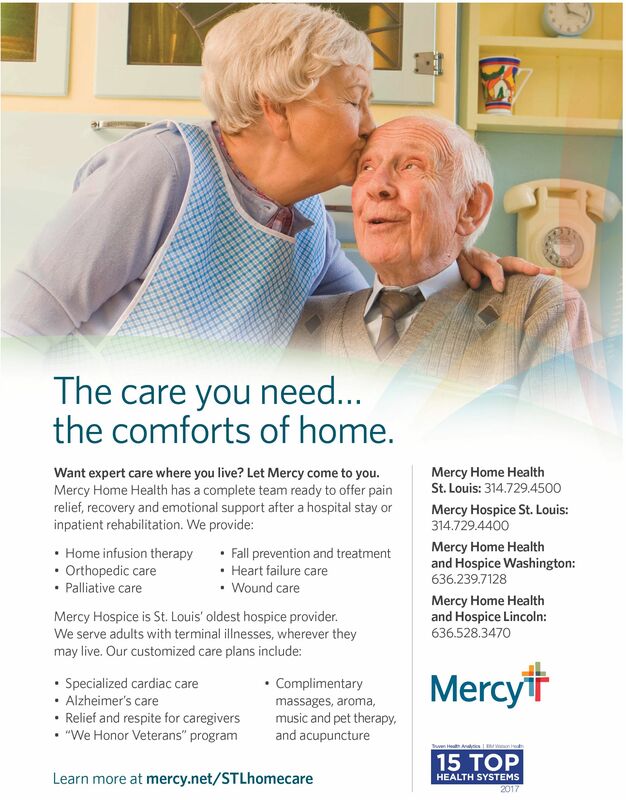 The benefit is a part of the Humana Gold Plus (HMO) plan and is only available to members who are enrolled in the plan in St. Louis. 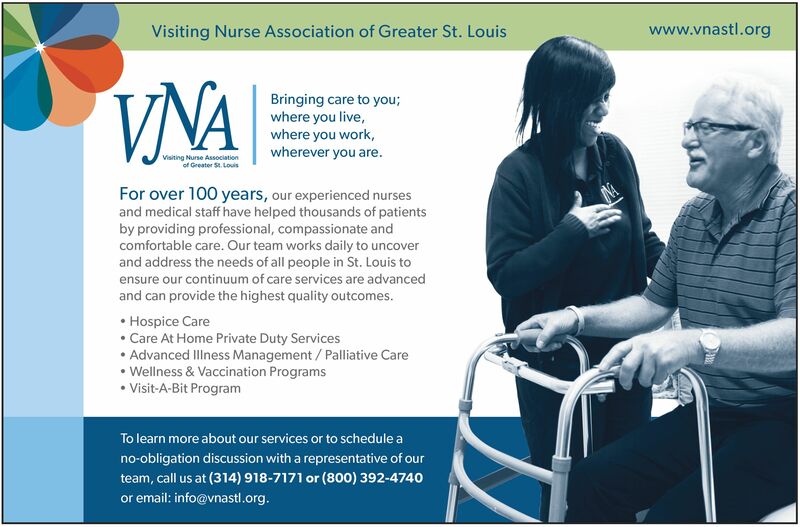 The benefit will be available to as many as 2,000 Humana members in the St. Louis area beginning January 1, 2019. For more information about Humana’s 2019 Medicare offerings, visit www.Humana.com/Medicare or call toll-free 1-877-877-0714 (TTY: 711). 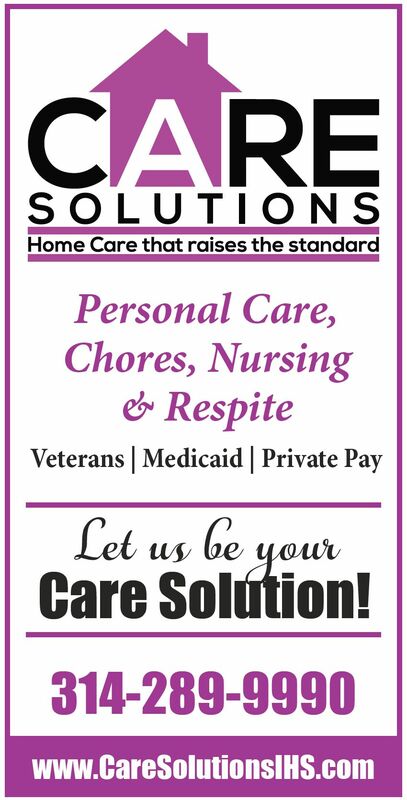 Care Solutions In-Home Services LLC is now contracted to provide home care to Veterans in St. Louis and the surrounding counties through the Veterans Choice Program Provider Agreement. 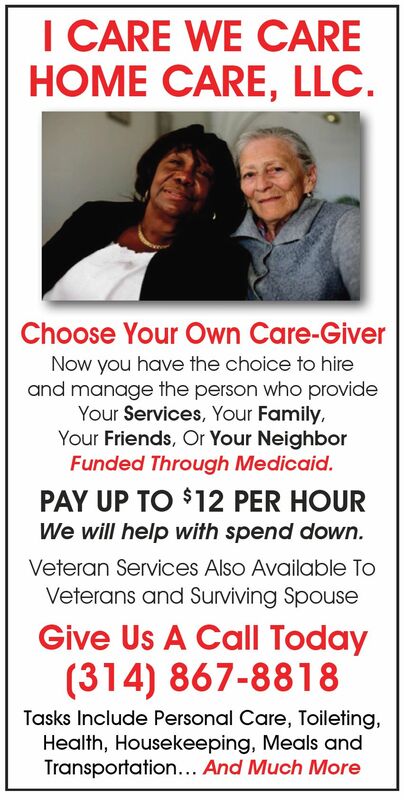 We also service Veterans or their surviving spouse through the Aid and Attendance Benefit Program. 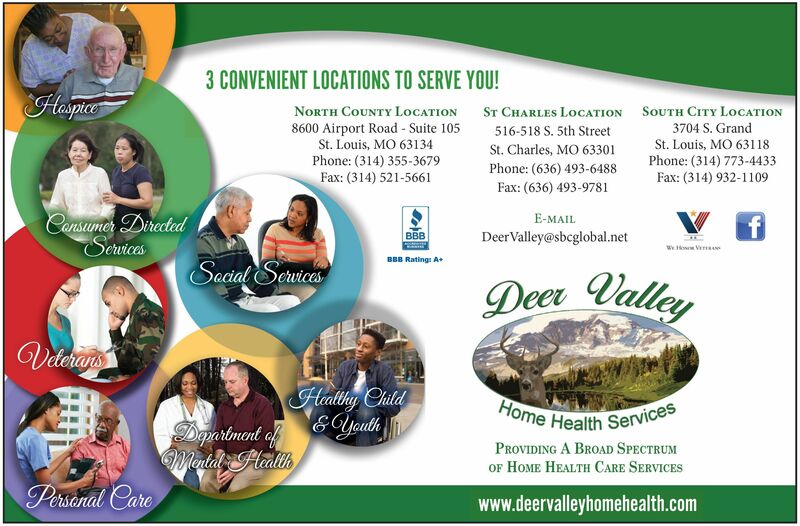 If you are a Veteran in need of quality home care services, contact our office at 314-289-9990. 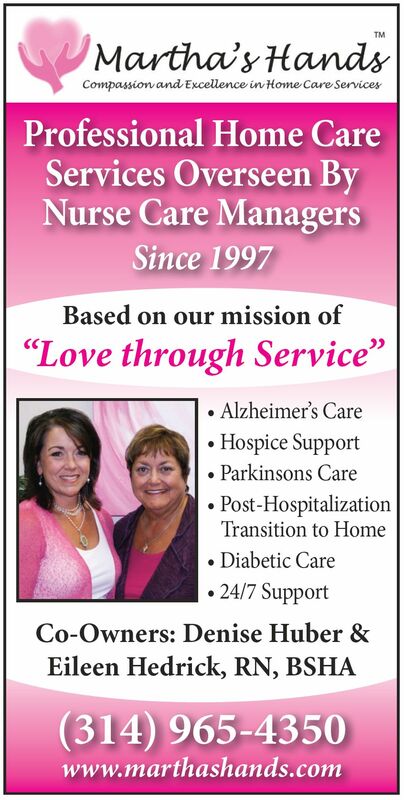 Let us be your Care Solution. Society for the Blind and Visually Impaired introduces new eyeglass mounted technology to St. Louis. The Society for the Blind and Visually Impaired announces the introduction of OrCam MyEye a new wearable device that mounts on glasses, receives visual information and speaks to the wearer, recognizes products and identifies faces. The Orcam is now available exclusively at the Society. According to David Ekin, President of the Society, “This device makes the world of difference for those who have limited vision. We are excited to introduce this remarkable device which interprets visual information using a smart camera mounted on the frames of the wearer’s eyeglasses and allows them to instantly and discreetly read their mail, newspapers and magazines, restaurant menus, even recognize faces and objects, opening up a whole new world! This only adds to the many options we offer for those with low vision”. OrCam is available for demonstration, training and purchase through the Society. The price for the base reader only is $2,500 or $3,500 ($4,500 wireless) for a device with all options. 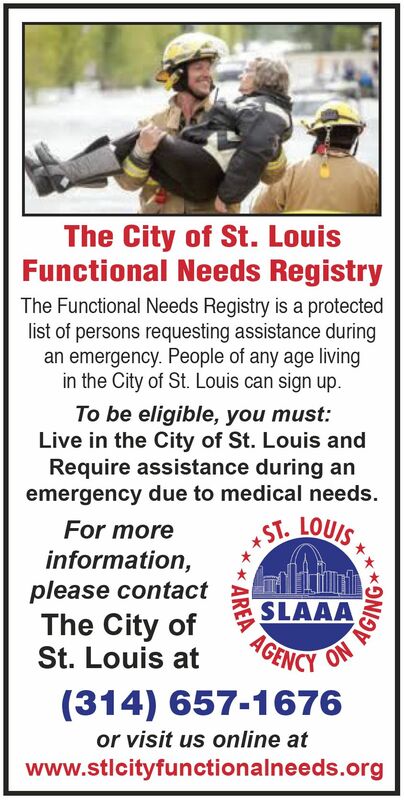 Anyone needing the Society’s services, including the OrCam demonstration, may visit www.slsbvi.org or call the Society’s office at 314-968-9000. Wednesday and Saturday 9:00 a.m. to 2:30 p.m. There are no news items for this category for this edition. 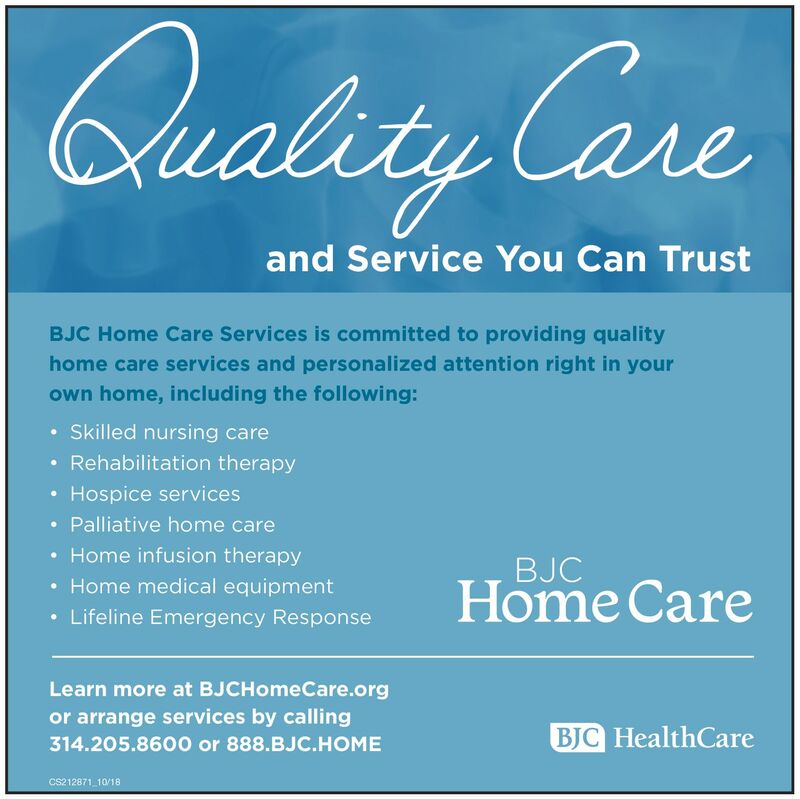 BJC Home Care Services provides a caregiver class on a variety of topics that are meant to provide useful information and support for caregivers, patients and families. 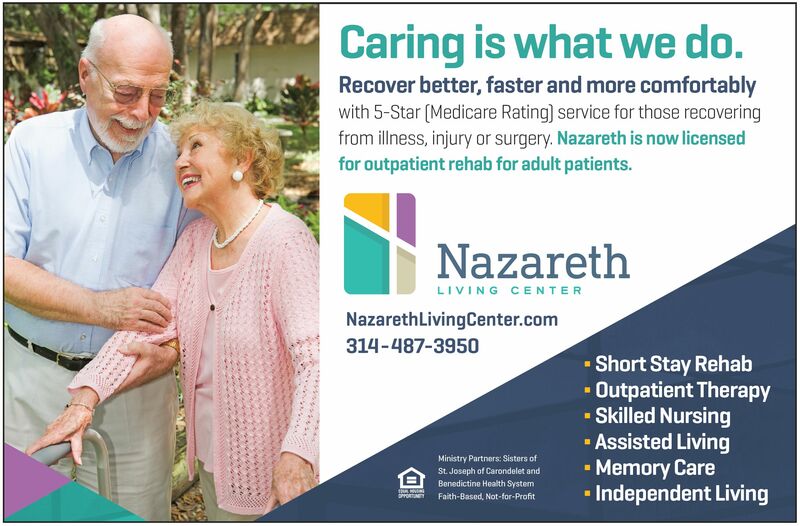 Dates: Second Tuesday of the month, 1:00 p.m. to 2:30 p.m. at Missouri Baptist Medical Center, Auditorium 1 on May 14, June 11, July 9, August 13, September 10, October 8, November 12, and December 10. Charitable Resale Shop Needs Your Help. Be part of the behind the scenes volunteer team that will accept and price donations for Hidden Gems Resale store in Crestwood, MO. Volunteers are needed help receive and sort merchandise destined for the store and to provide customer service and serve as cashiers. This opportunity is suitable for individuals over 18. All proceeds from the store will help residents, clients and patients who need financial assistance toward their care or services received from Lutheran Senior Services. 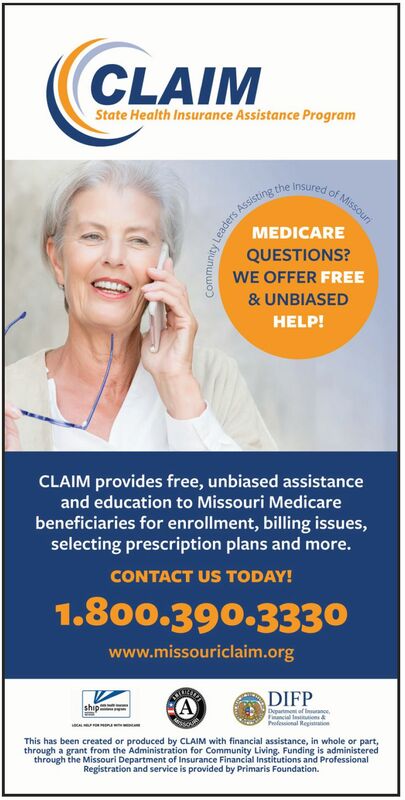 The Missouri Poison Center would like your help in finding audiences for a new program targeted at seniors ages 65 years and older who are independent in taking their medications. We are looking to speak to groups up to about 15 adults in a conversational/interactive program to teach about avoiding medication mishaps. We will address such topics as: being an active assertive participant in your own health care, keeping an up-to-date medication list, and safe storage and administration of medications. This program will take approximately 60 minutes. 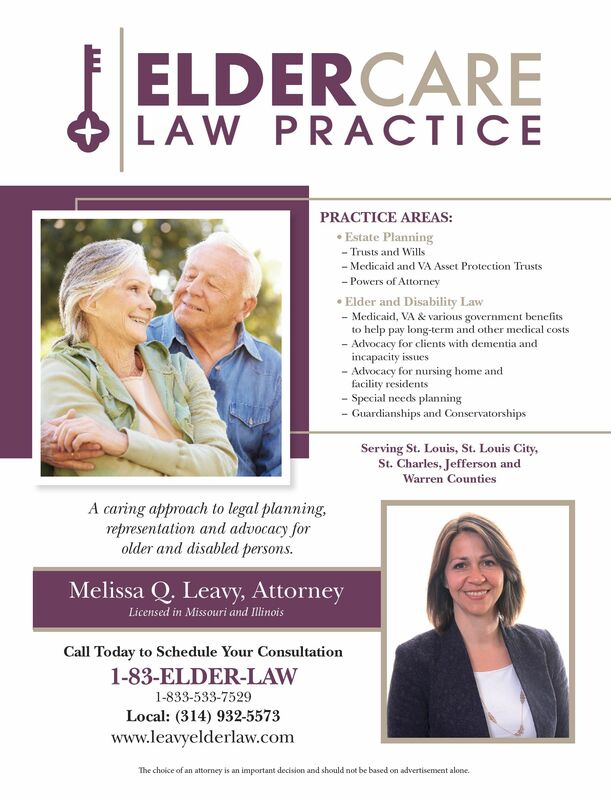 If we can provide this program to your senior group or you have interest in medication safety please contact Amanda Ruback, at the Missouri Poison Center. Amanda Ruback, amanda.ruback@ssmhealth.com, Missouri Poison Center, 314-612-5719, www.missouripoisoncenter.org. 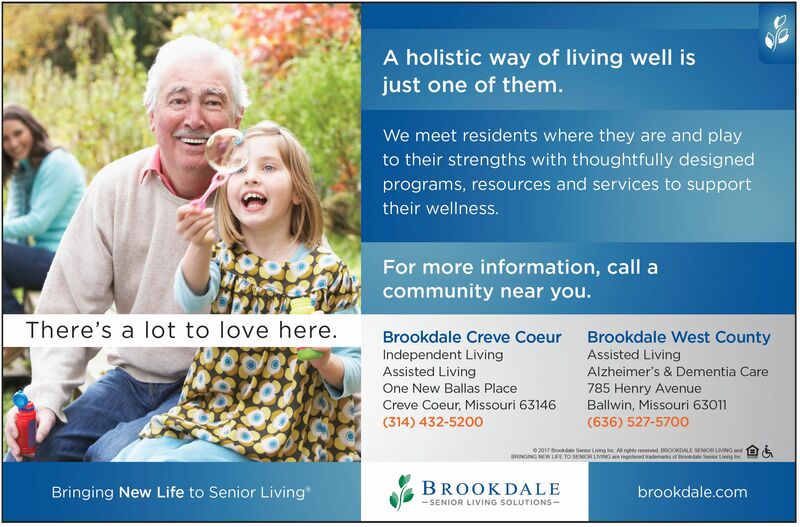 May 4 – 10:30 a.m. to 1:30 p.m.
Bilingual International seeks volunteer for balloon twisting at May 4 senior center/volunteer/picnic at Tower Grove Park,10:30 a.m. to 1:30 p.m. Balloon twister may come any amount of time during that span. Volunteer would receive a wonderful lunch and interesting experience with our diverse array of guests. 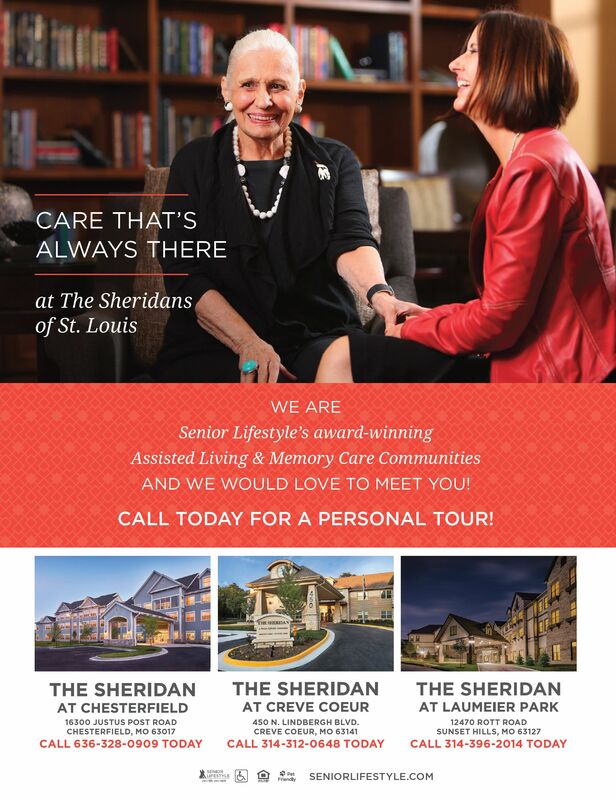 Please contact ellen.sherman@bilingualstl.org. 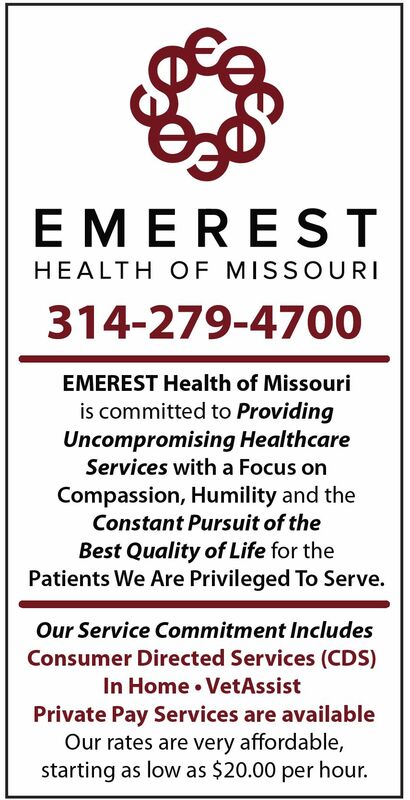 The Eastern Missouri Regional Arthritis Center is looking for volunteers to help lead a new physical activity initiative called the Walk With Ease (WWE) program. 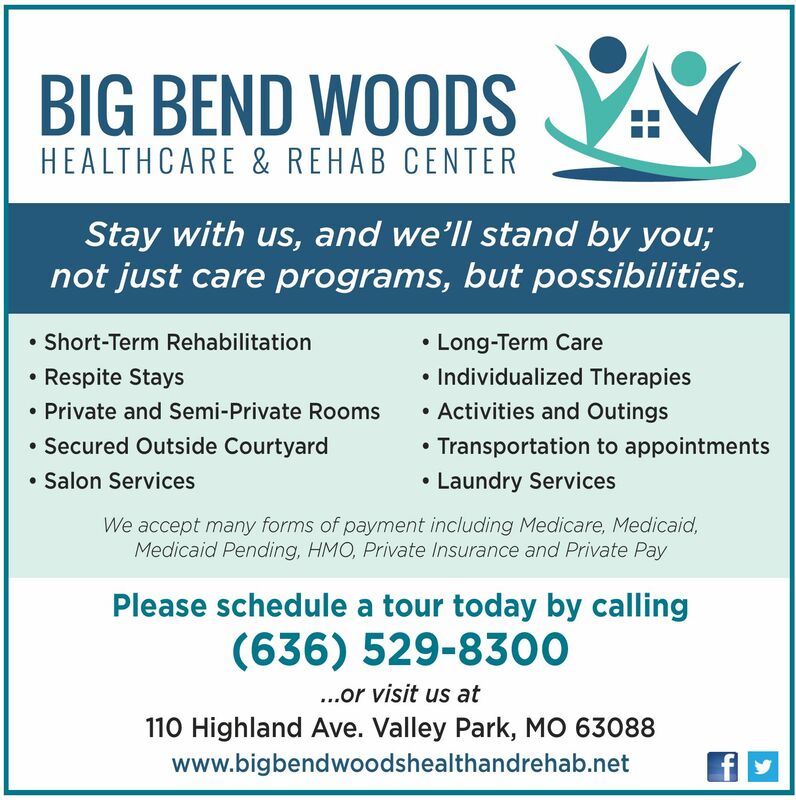 The purpose of the program is to help increase physical activity and overall physical and mental health for adults with chronic health conditions, such as arthritis, diabetes, heart disease, depression, and emphysema/COPD. Volunteer leaders will also experience these benefits! Leaders will be trained on how to lead this program for groups of adult participants. Each group meets 3x/week for 6 weeks. 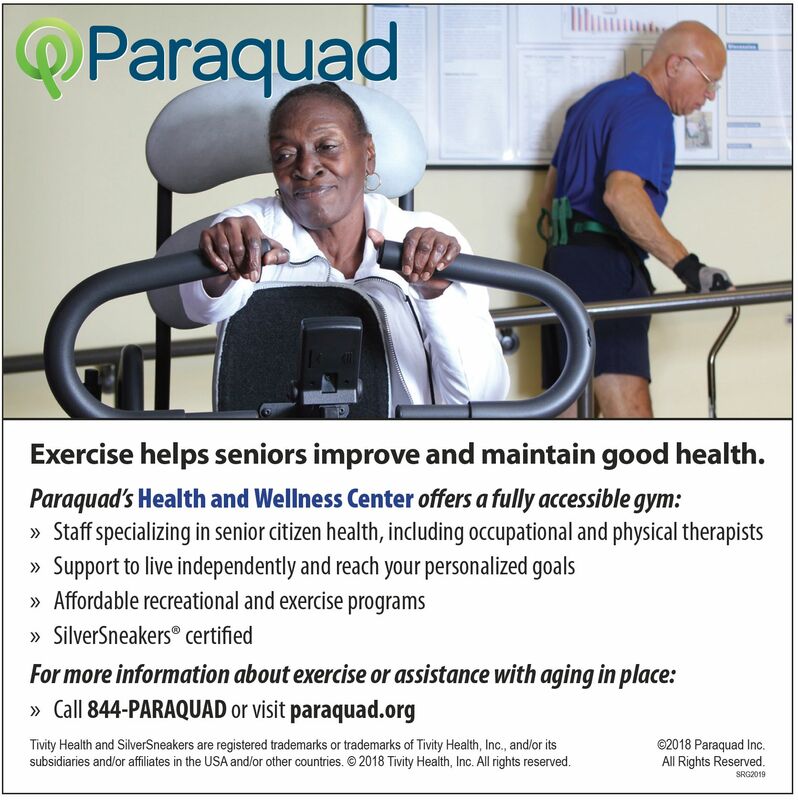 Interested in getting some exercise while helping others? Visit www.moarthritis.org for more information on Walk With Ease, and contact Dr. Duana Russell-Thomas at duanacrussell@wustl.edu if you are interested in volunteering as a group leader. 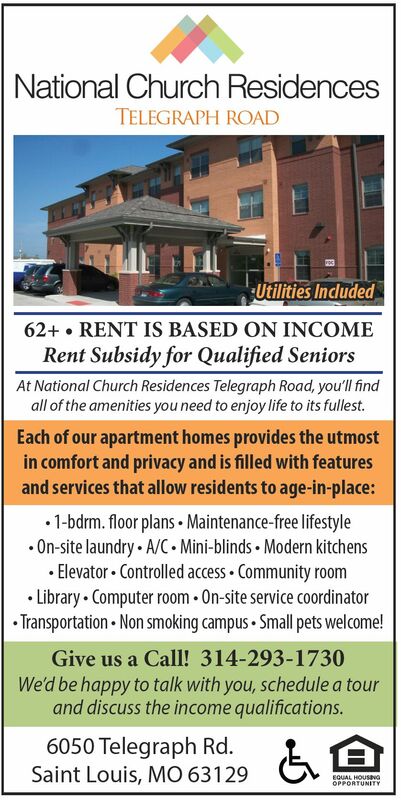 Some of our senior residents need a little assistance getting from here to there within their Lutheran Senior Service community. Assisting with pushing a wheelchair or lending a steady arm can mean so much to someone and allow them to join in on daily activities. Consider volunteering as a transporter. (No driving required). 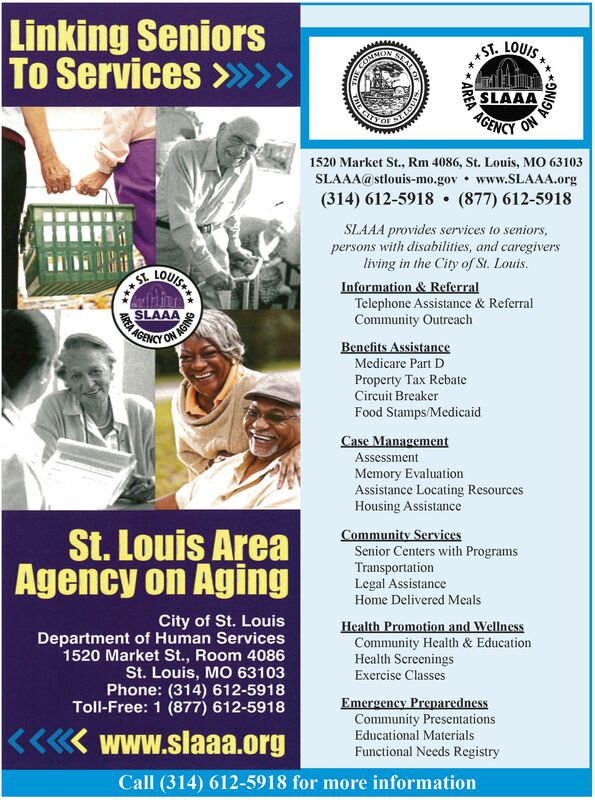 Aging Ahead is looking for dependable drivers to deliver Meals on Wheels to home-bound seniors in St. Louis, St. Charles, Franklin and Jefferson County. We serve over 2700 meals a day to seniors who depend on our services. This volunteer position commit is as little as one day a month or once a week. 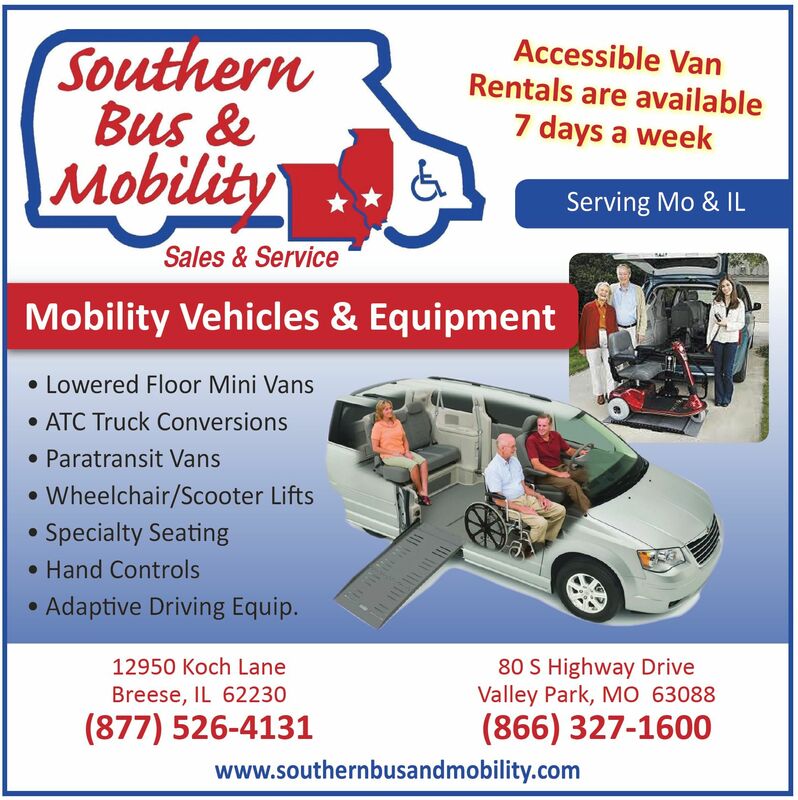 You will be delivering a noontime meal to a specific route of your choice in one of our four counties. Time and days are flexible. 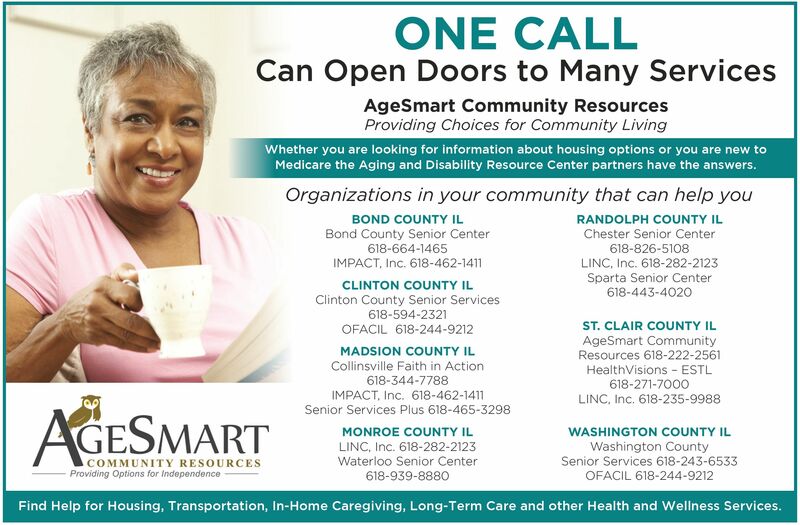 Contact info@agingahead.org to get more information. Make a difference in someone's life by volunteering. Provide a needed hug or listen to cherished memories. 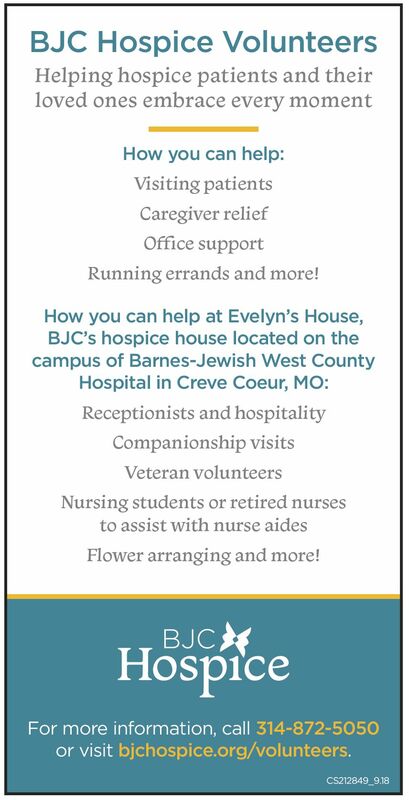 If you or someone you know is interested in volunteering please contact me, Tracy, at Preferred Hospice by phone 636-527-9330 or email tsweazey.stl@preferredhospice.com. We are Connect Room & Board, created by two moms wanting to make college more affordable. Connect R&B is a network of hosts and students who, once they pass a background check, register on our site to communicate details such as house rules prior to forming a match. Once the match is made the student pays $1,500 for one semester of housing. 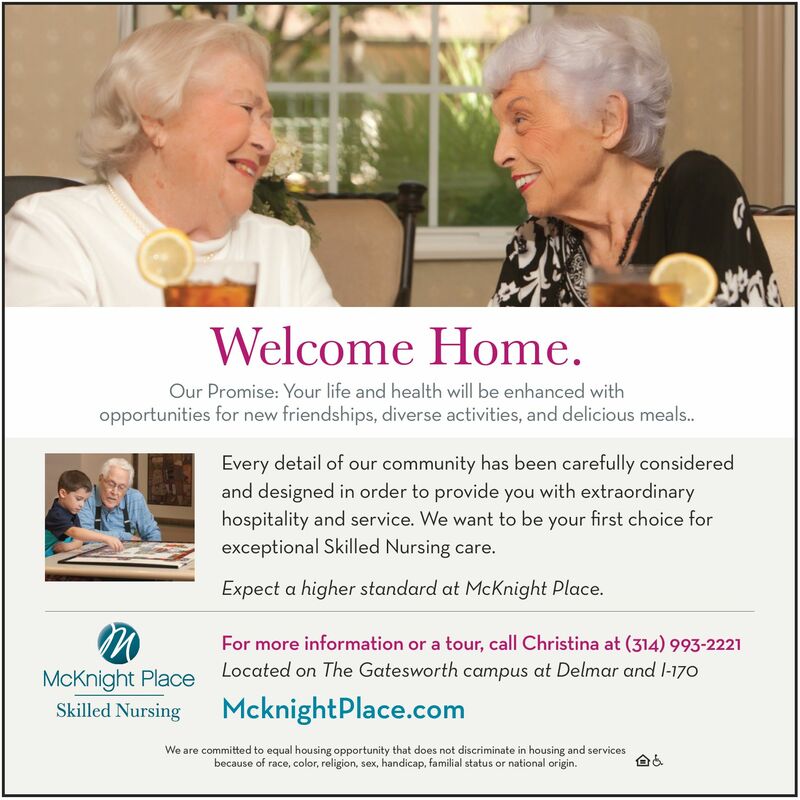 We are currently looking for hosts and have found that seniors benefit greatly from this program as guests can exchange help around the house, rides to appointments and companionship for reduced rental of a spare room. Our goal is to aid as many students as possible achieve the dream of a higher education. A research study is underway to see if exercise and testosterone gel for six months improves physical function after a hip fracture. You may qualify if you are a female age 65 or older and have had surgical repair of a hip fracture in the last 14 weeks. All transportation is provided. Contact 314-273-0337 or banachm@wustl.edu for more information. Anodyne Podiatry is prepared to provide specialized foot care in your home. Our clinicians are health professionals, providing preventative care to improve comfort and mobility. A medically trained clinician provides care assistance, nail care, assessments in areas of concern, and with your physician develops an individualized treatment plan. Anodyne Podiatry home foot care provides in-home nail care, preventative care, and follow-up care of the feet. Join us and learn how easy and little time it takes to have such an enormous impact on your local community. Learn the impact the American Red Cross volunteers have on the local community and how you can help: save lives by installing smoke detectors, provide support at local blood drives, and more. Learn about the menu of volunteer opportunities and ways you can give back to your community Speak directly to the volunteers and staff from each line of service, ask questions, and learn why they are so passionate about what they do. Come experience the mission and find out if the American Red Cross is the right fit for you to volunteer. November is a traditional time for recognizing the service and commitment of those who have served their country as a member of the Armed Services. 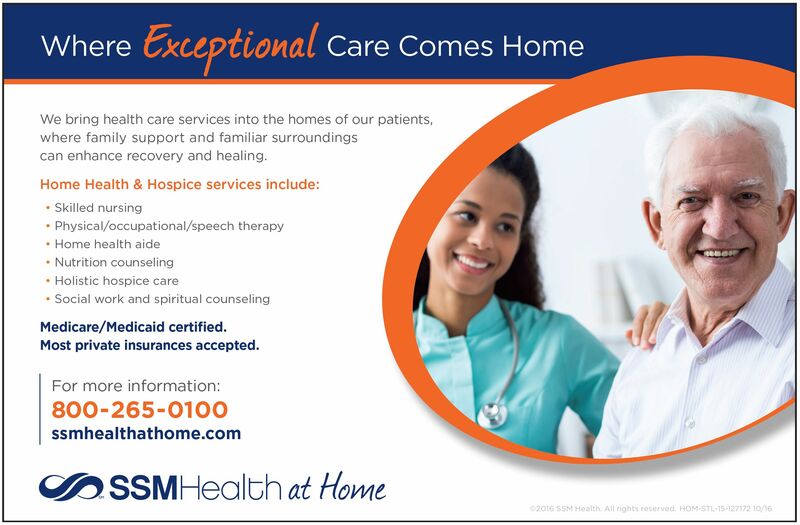 FYI, Medicare guidelines require all hospices to have a team of volunteers providing day-to-day administrative and/or direct patient care services in an amount that equals at least 5% of total patient care hours of all paid hospice employees and contract staff. Thank you in advance for helping us spread the word. 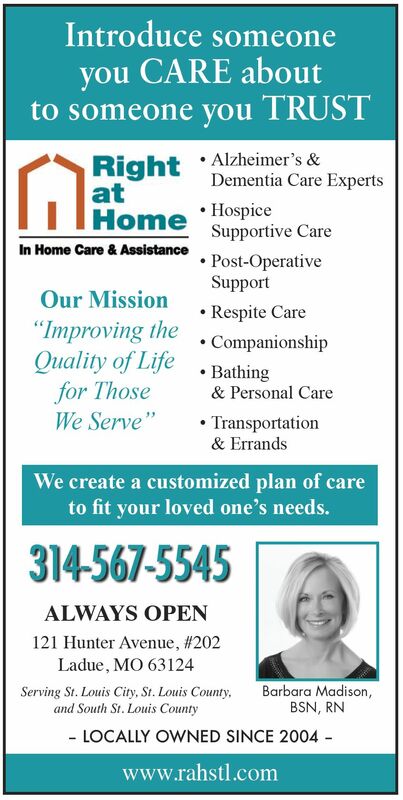 314-567-4700, or see the website http://www.stlhelp.org. The Overland Farmers Market is at 2512 Woodson Road. See website http://overlandfarmersmarket.com.